rest cursor on thumbnail photo, then scroll down to related text below. 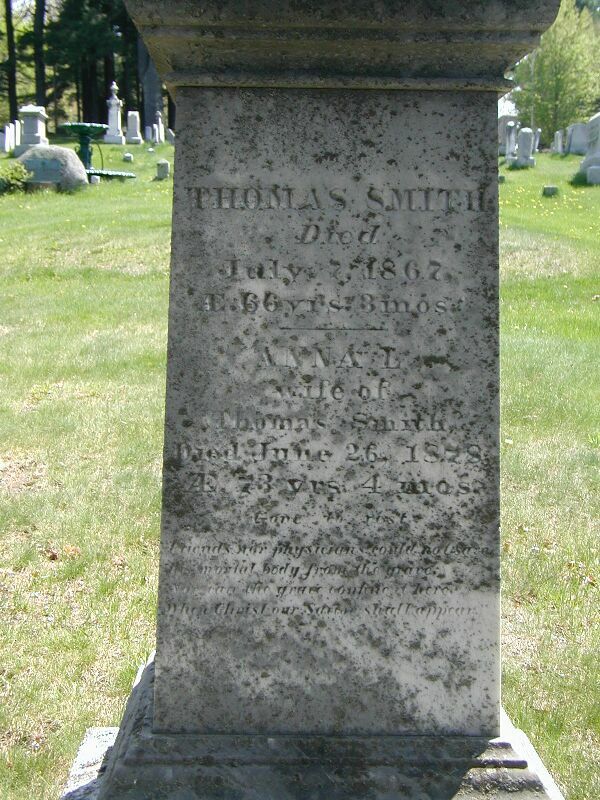 (John Smith is a great-grandson of Lt. Thomas Smith, settler. 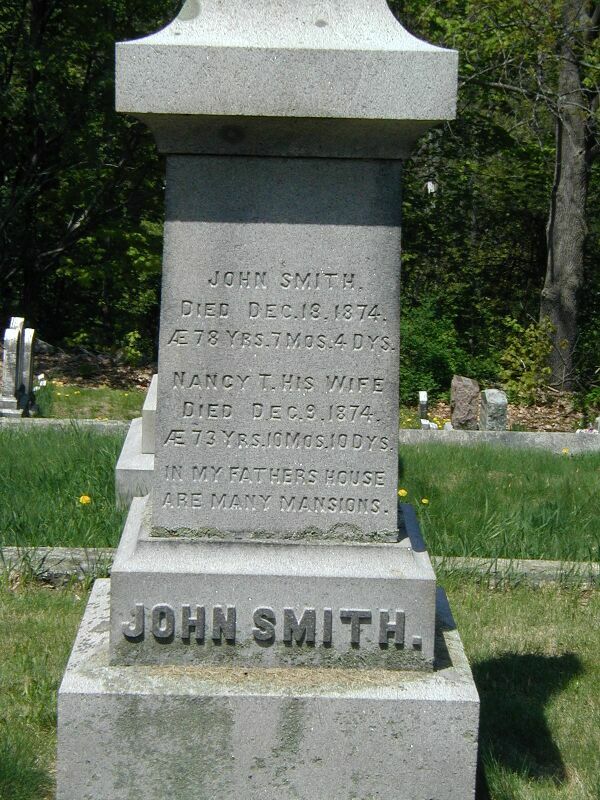 John Smith died Dec. 18, 1874 AE. 78 yrs. 7 mos. 4 dys. Nancy T(ewksbury) his wife died Dec. 5, 1874 AE. 73 yrs. 10 mos. 10 dys. 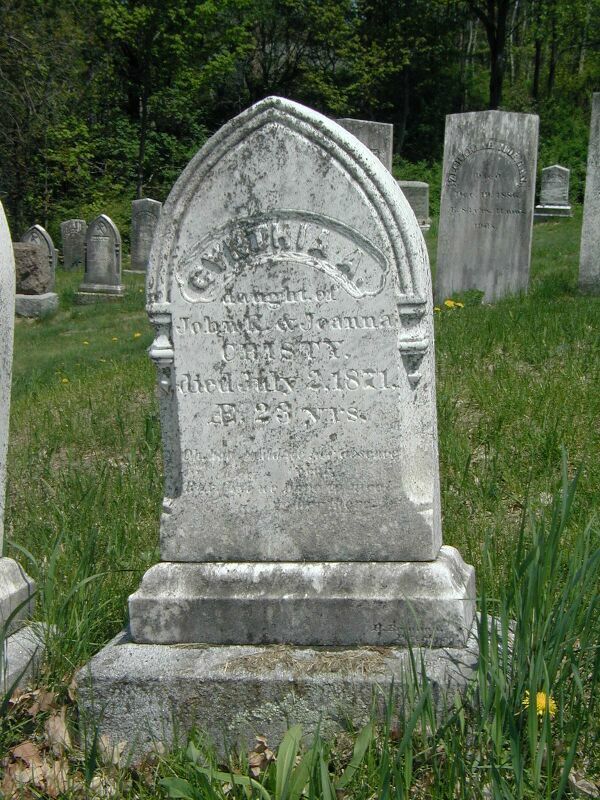 Clarinda Smith died Aug. 14, 1837 Aged 1 yr. & 3 dys. James K.P. 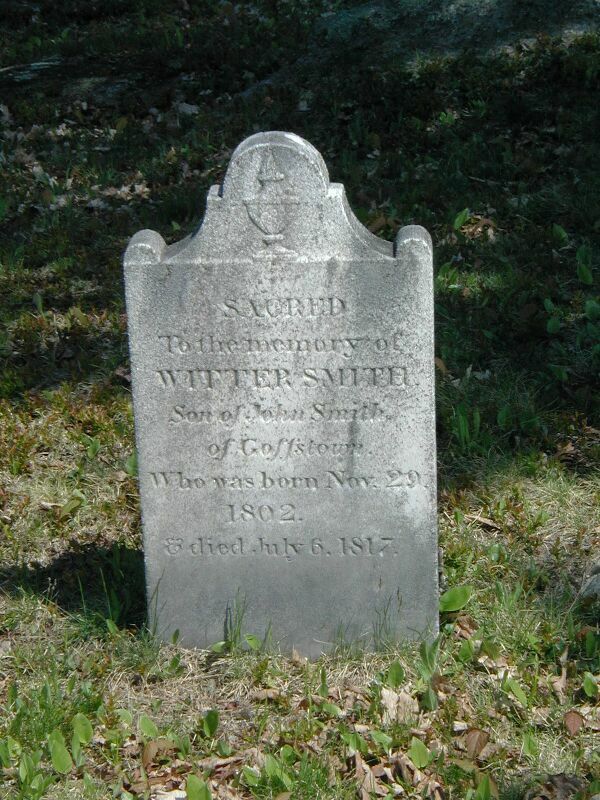 Smith died Sept. 25, 1849 Aged 4 yrs, 6 mos, 11dys. 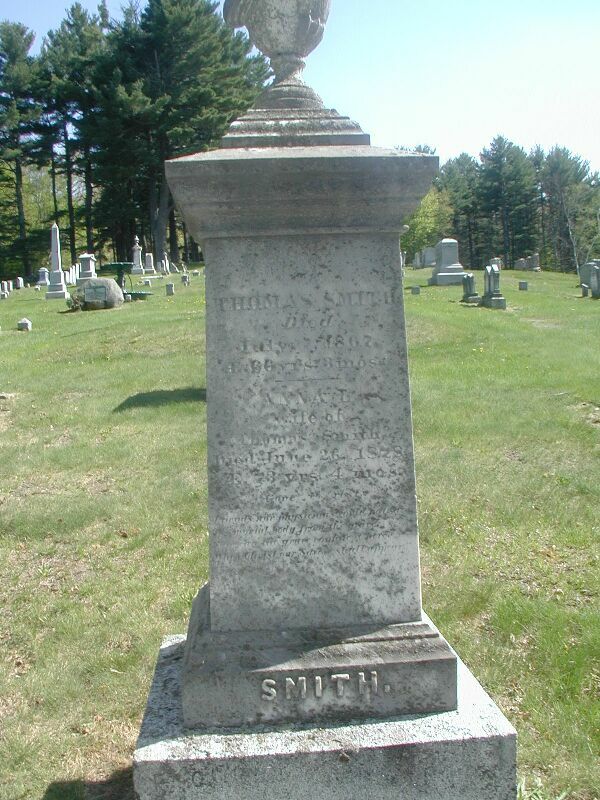 Sarah T. Smith died Nov. 22, 1901 Aged 66 yrs.11mos.21dys. 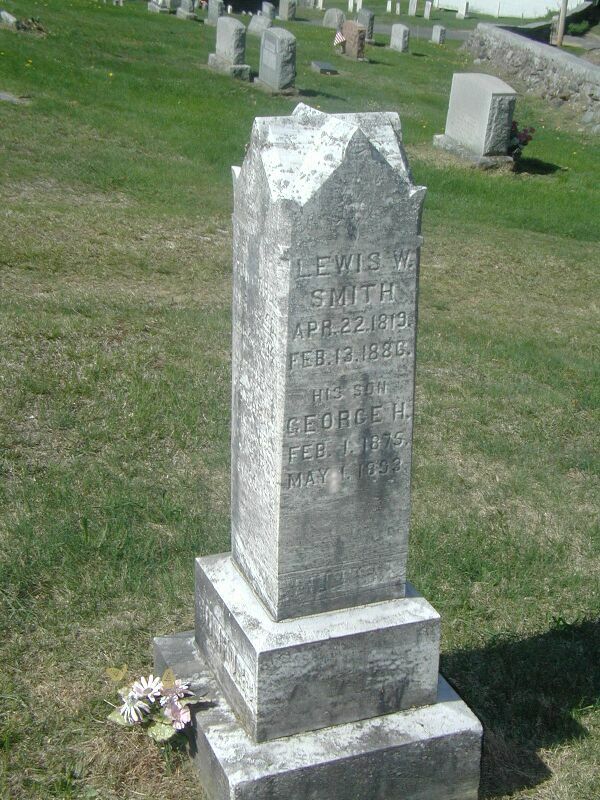 Almas Smith died Mar. 30, 1916 AE. 78yrs. 1 mo. 8 dys. Martha A. his wife died Apr. 10, 1899 AE (30) yrs 6.mos. Dea. 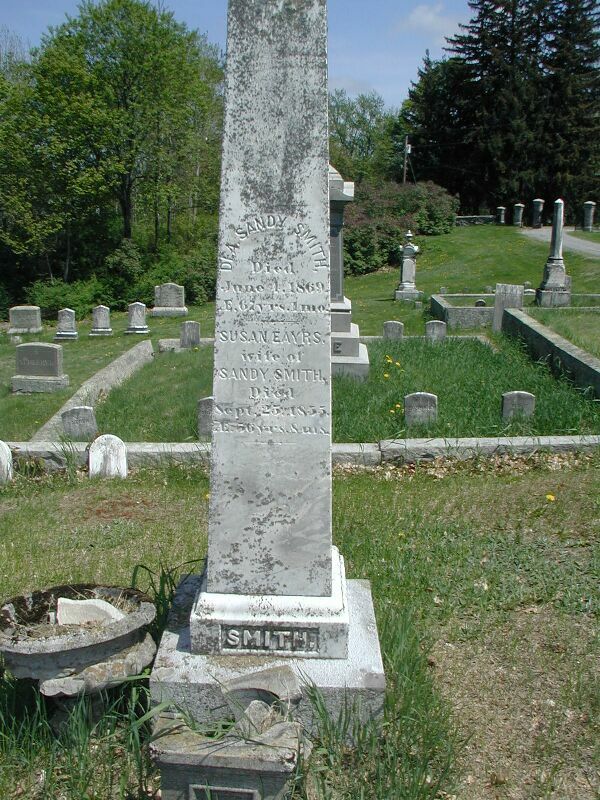 Sandy Smith died June 1, 1869 AE. 67 yrs. 1 mo. Susan Eayrs wife of Sandy Smith died Sept. 25, 1855  AE 56 yrs. 8 mos. Charles Sandy son of Sandy & Susan E. Smith died Dec. 19, 1853 AE 11yrs. 10mos. L. Jefferson son of Sandy & Susan E. Smith died June 24, 1897 AE 66 yrs. 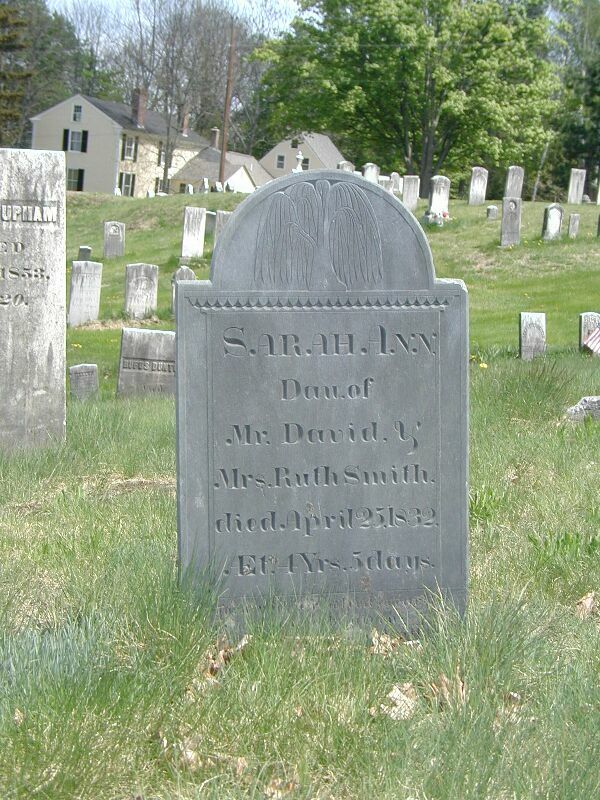 David D(exter) Smith died Oct. 21, 1900 AE. 70 yrs. Ellen M. Tucker wife of David D. Smith died (May 2, 1916) AE. 80yrs. 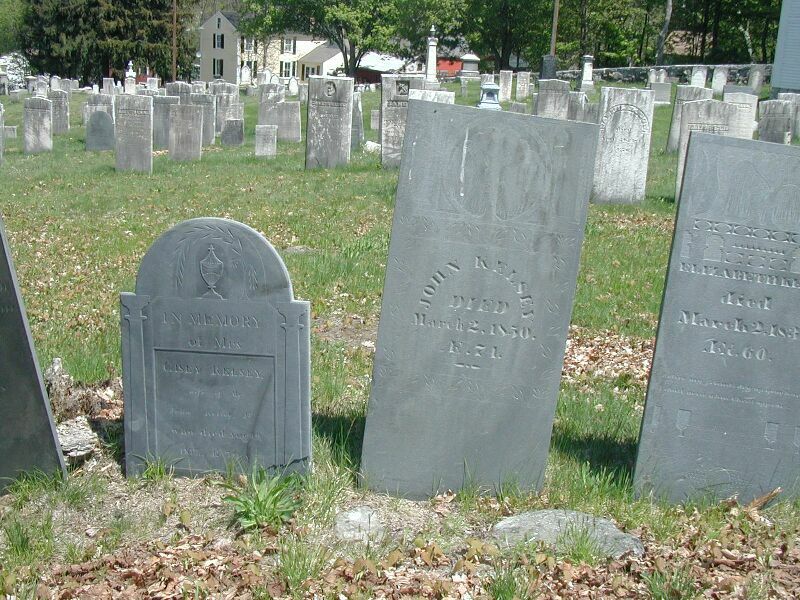 Benjamin S(mith) Woodbury died Dec. 26, 1846 AE 73 yrs. Sally B. (Jones) wife of Benj. S. Woodbury Jan. 27, 1883 AE. 86yrs. 8mos. & 13dys. 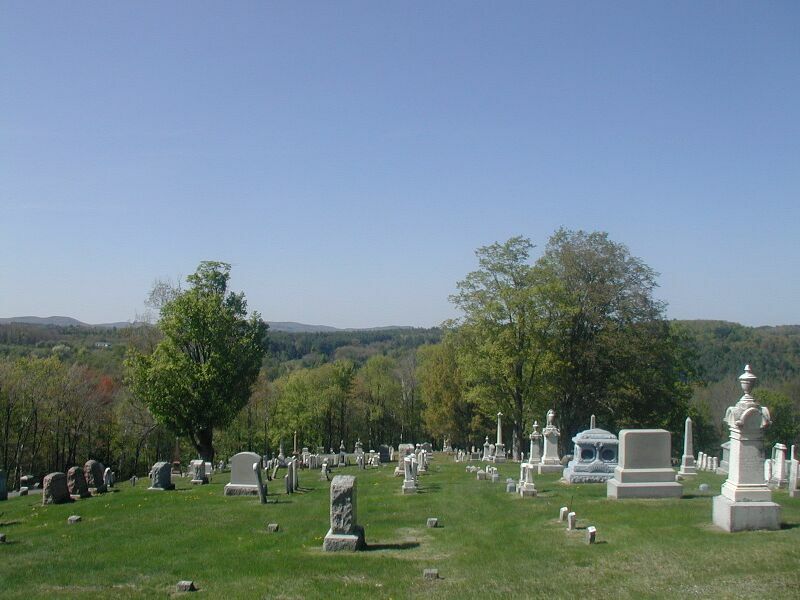 Benjamin F(ranklin) Woodbury died Apr. 6, 1885 AE 63 yrs. 1 mo. AE. 51 yrs. 6 mos. Mary J. Norton wife (#2) of Benj. 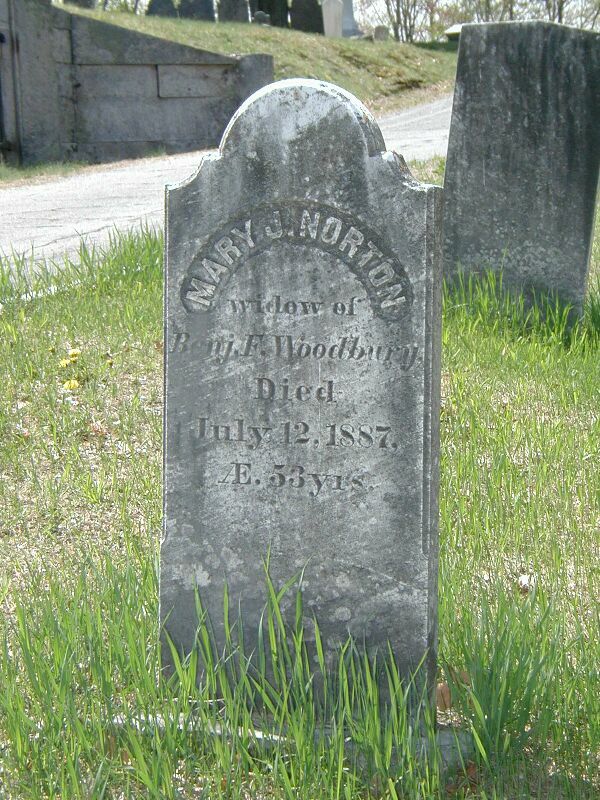 F. Woodbury died July 12, 1887  AE.57 yrs. Cynthia A.  daughter of John K. & Joanna Christy died July 2, 1871  AE. 23 yrs. Joanna (Balch) wife of John K. Christy died Apr. 26, 1892  AE. 77yrs. 22 ds. "I will be with thee in six troubles and in seven. 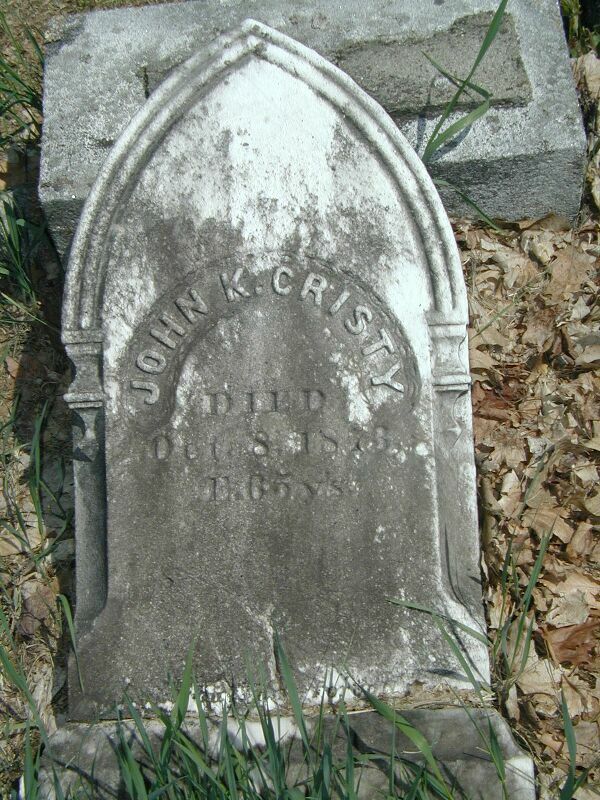 I will not forsake thee"
John K. Christy died Oct. 8 1876  AE. 65 ys. 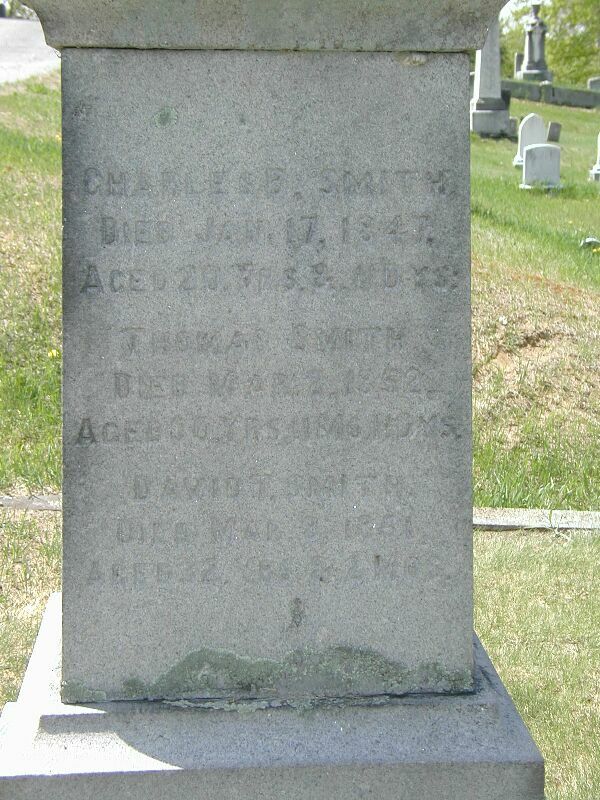 (David Smith was a great-grandson of Lt. Thomas Smith, settler. 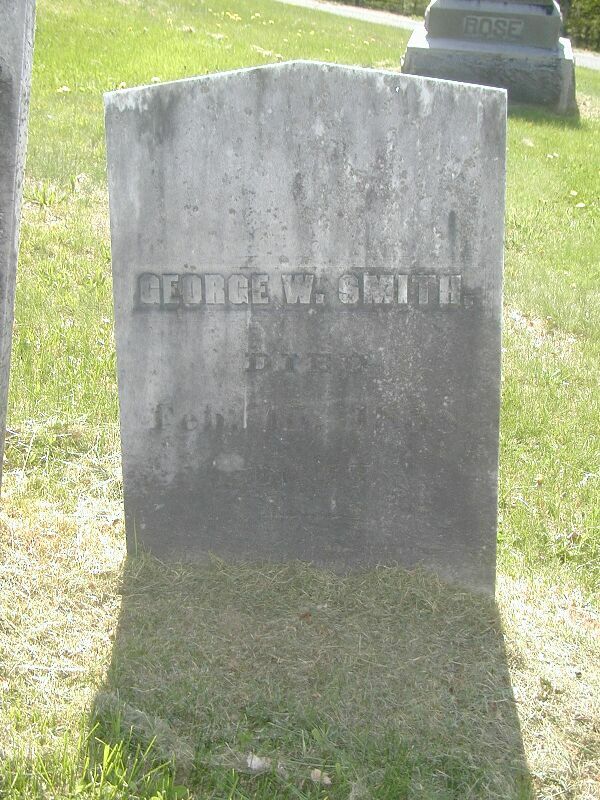 David Smith Jr. died Sept. 20, 1830 Aet. 9 yrs. 7 mon. 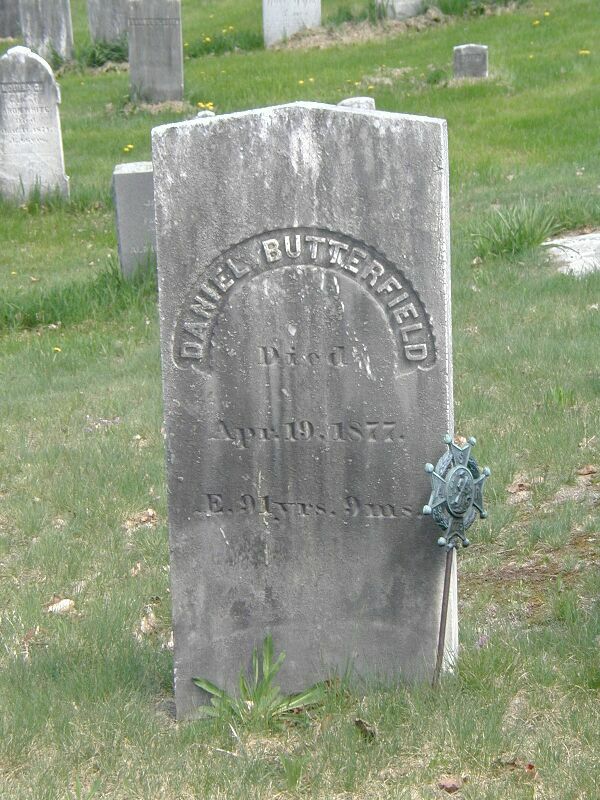 Daniel Butterfield died Apr. 19, 1877  AE.94yrs.9ms. 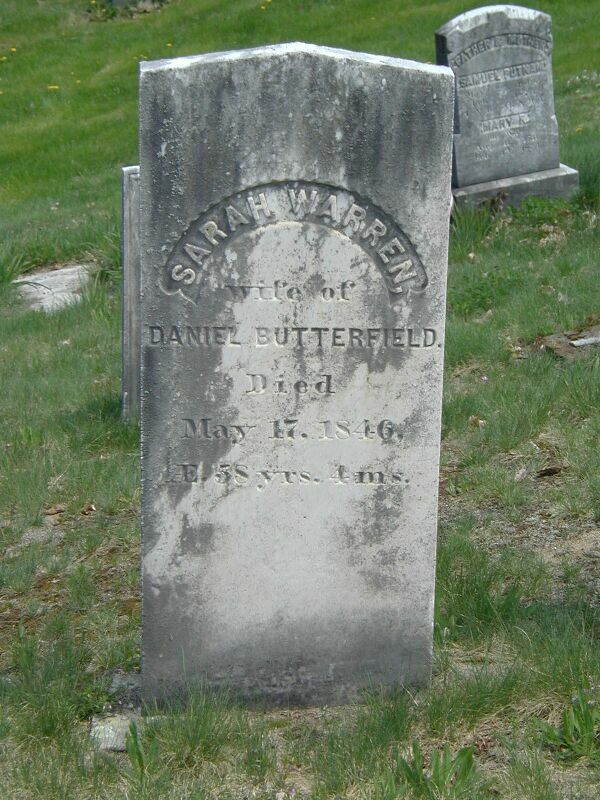 Sarah Warren wife of Daniel Butterfield died May 17, 1846 AE. 58 yrs. 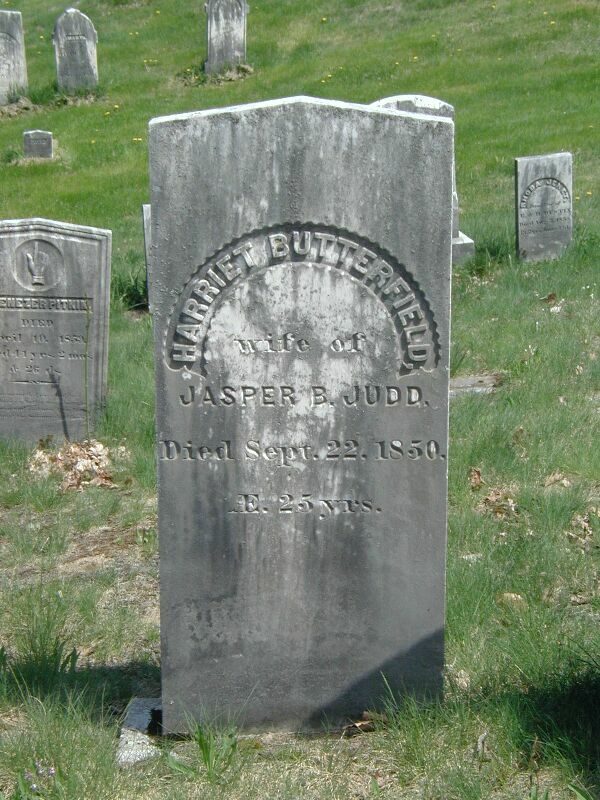 4 ms.
Harriet Butterfield wife of Jasper B. Budd died Sept. 22, 1850  AE. 25 yrs. Fanny J(ones) wife of Robert Wilson died Jan. 10, 1890 AE. 87 yrs. 11 ms.
Deborah P. Wilson died Apr. 7 1899  Ae. 88yrs. 9ms. 21 ds. Parker B. Wilson died Feb, 18, 1879 AE 62 yrs. 18 dys. Mar. 25, 1863  AE 45 yrs. "Member of Co.H. 16th Regt. N.H.V." 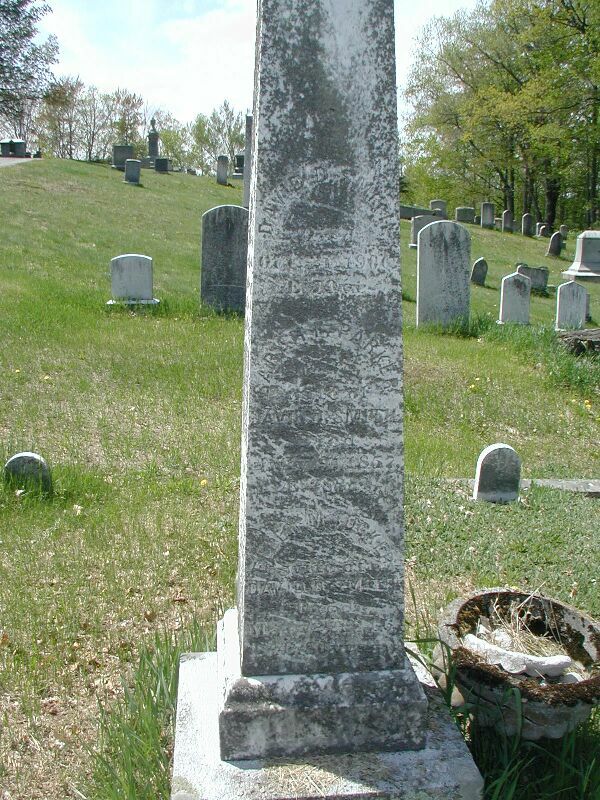 Betsey Wilson died June 4, 1871 AE. 70 yrs. 3 ms. 12 ds. 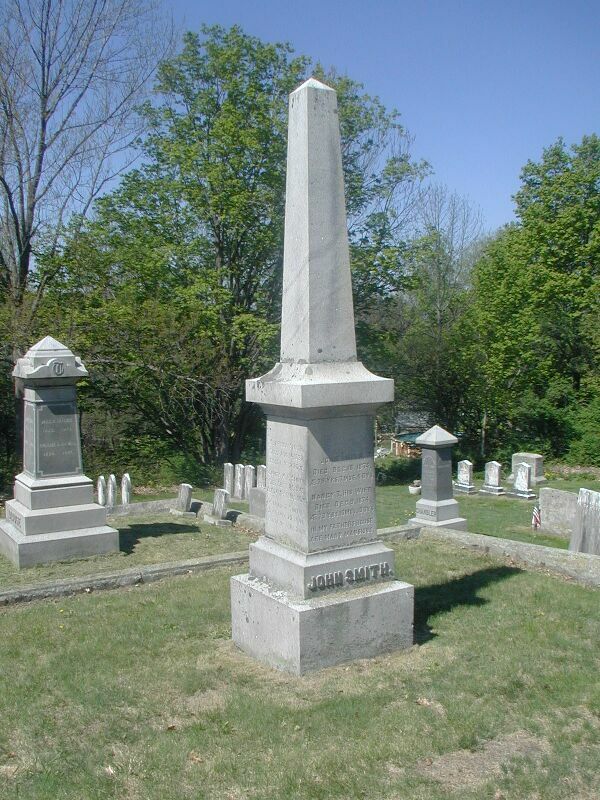 James Wilson died Dec. 19, 1877 AE. 71 yrs. 7 ms. 12 ds. 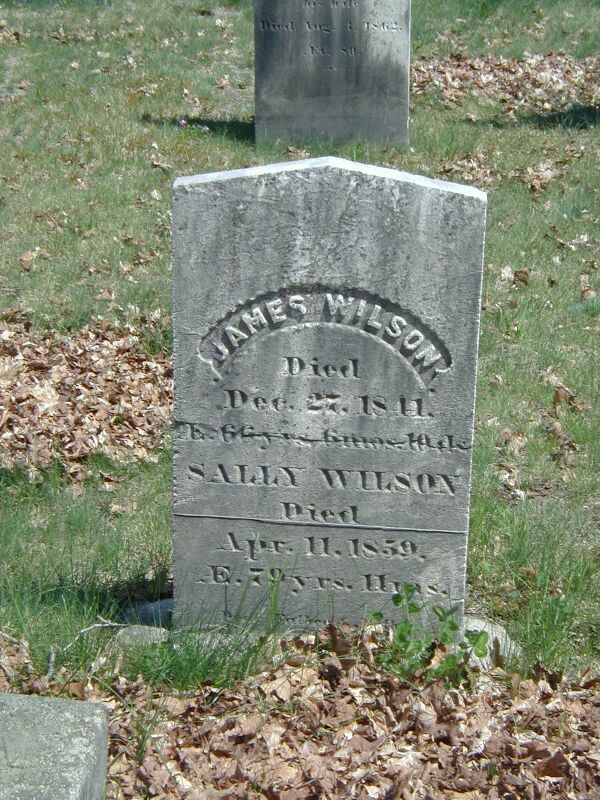 James Wilson died Dec. 27, 1841 AE, 66 yrs. 6 mos. 10 ds. Sally Wilson died Apr. 11, 1859 AE. 79 yrs. 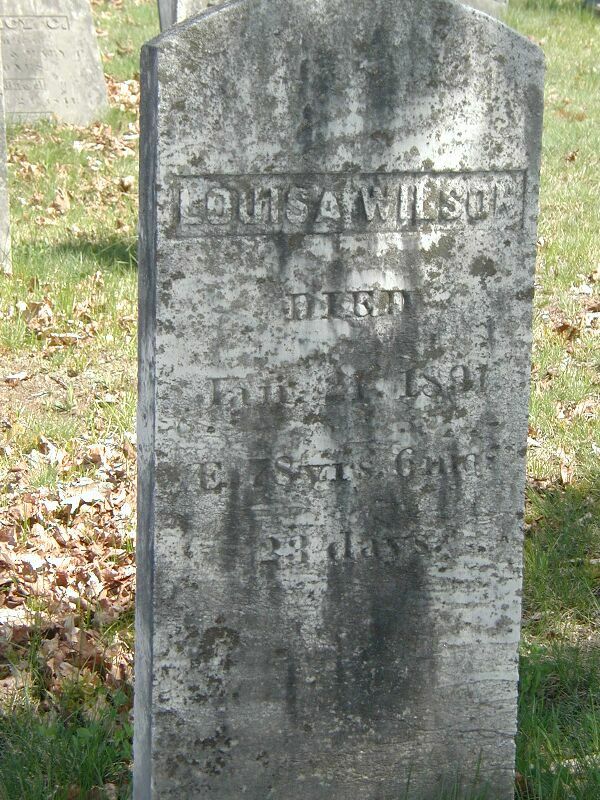 11 ms.
Louisa Wilson died Jan. 31, 1891 AE. 78 yrs. 6 mos. 23 days. 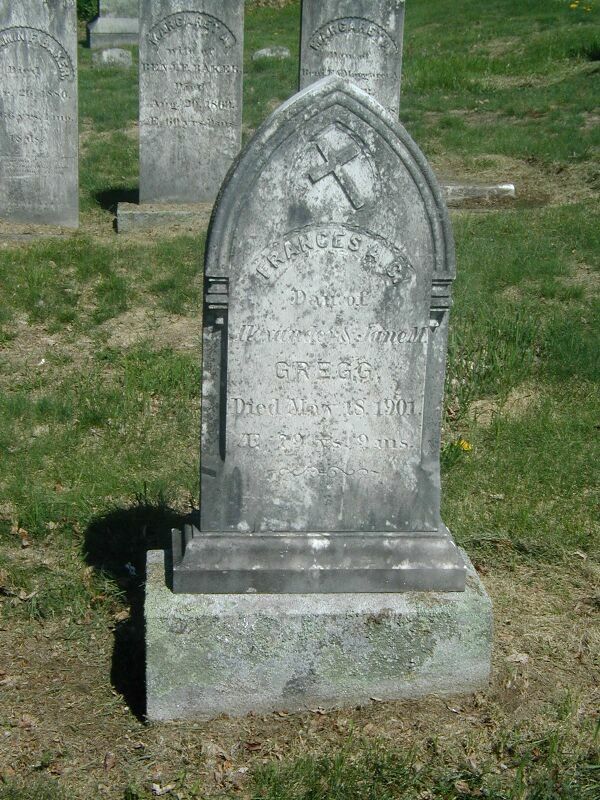 Alexander Wilson died Jan. 8, 1864 AE. -- yrs. 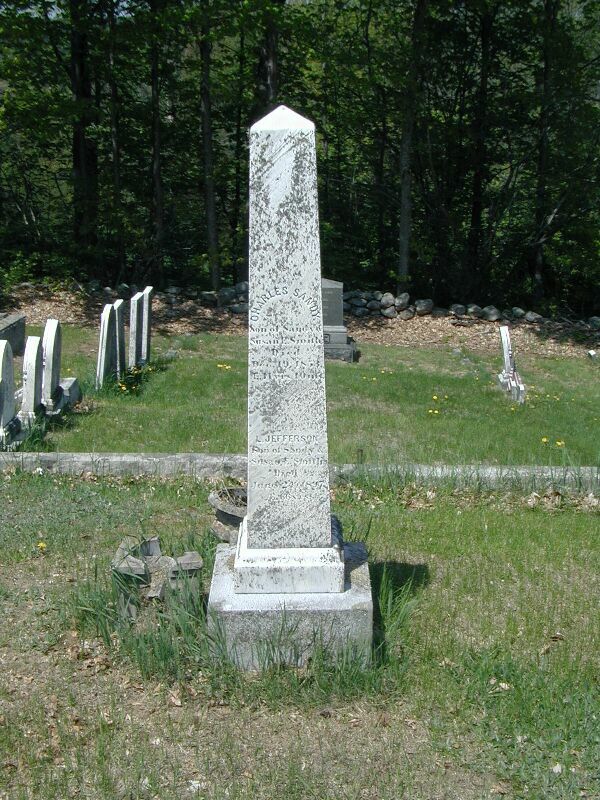 "Brother"
Reuben Wilson died Oct. 21, 1841 AE. 66 yrs. 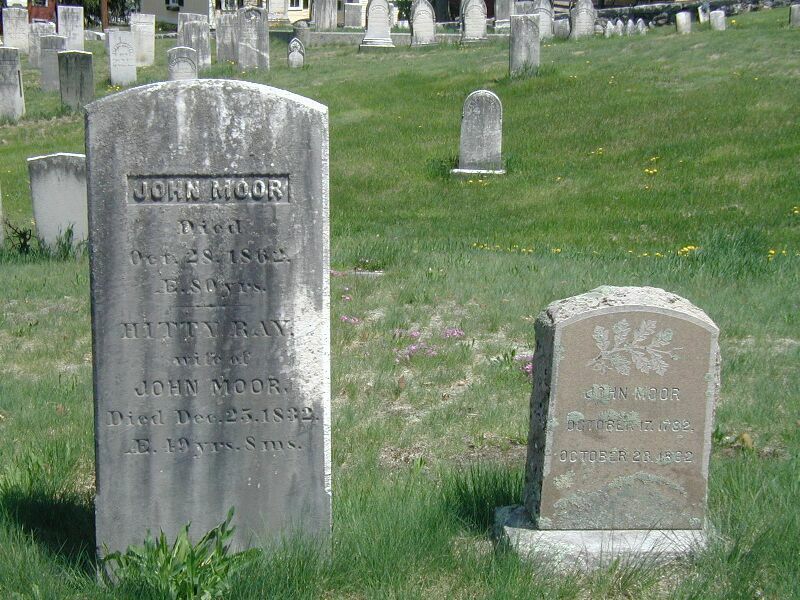 "She was a true friend and ---"
John Moor died Oct. 28, 1862 AE. 80 yrs. 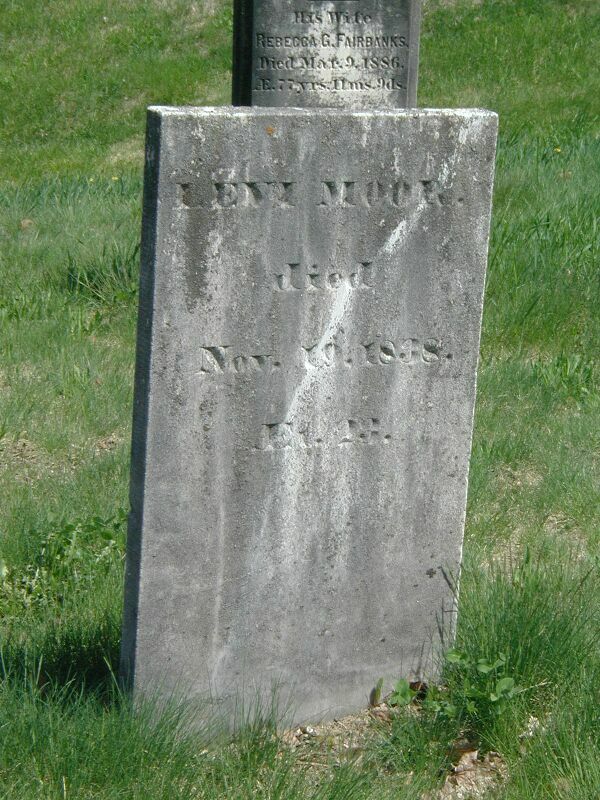 Hitty (Mehitable) Ray, wife of John Moor, died Dec. 25, 1832  AE. 49 yrs. 8 ms.
AE. 92 yrs. 10 mos. 22 dys. AE. 87 yrs. 3 mos. 3 dys. 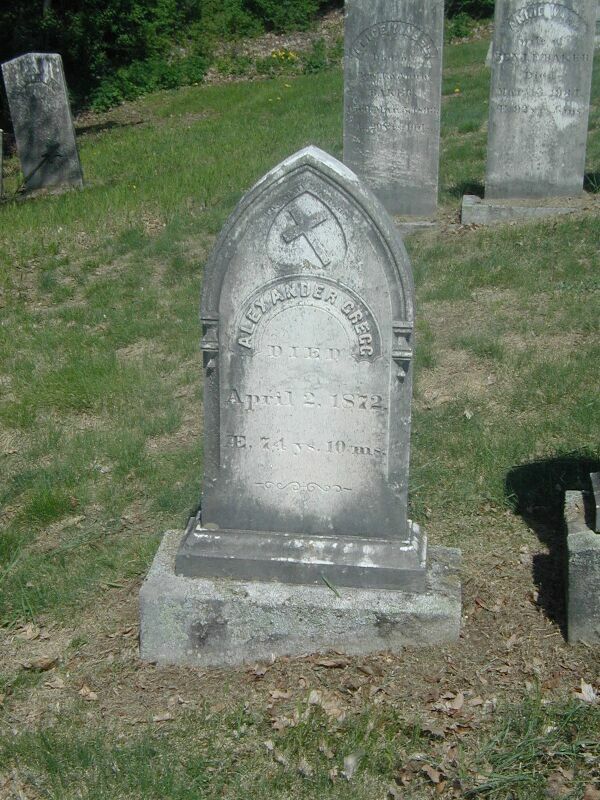 Peter Jones died May 15, 1873 AE. 80 yrs. AEt. 8 months & 17 days. 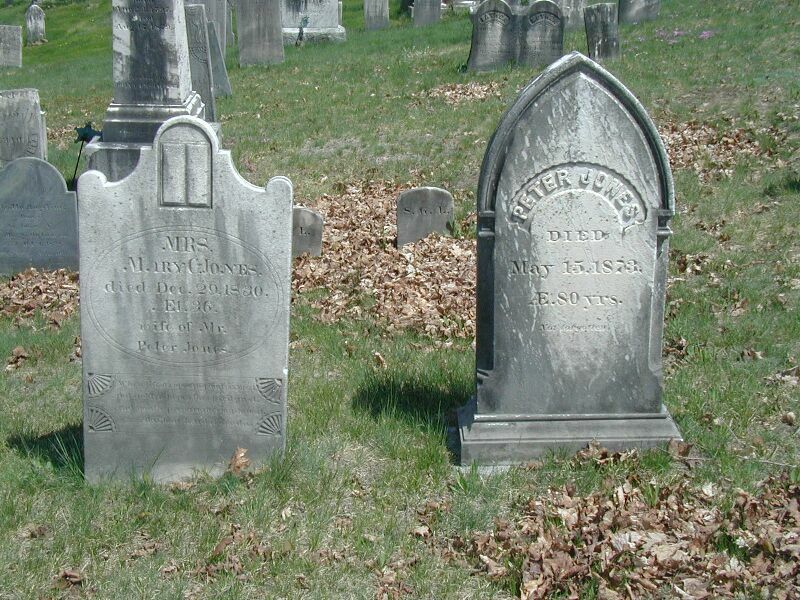 "Happy infant, only..."
"Retire my friend, dry your tears I shall arise when Christ appears"
William Kelso died Oct. 11, 1869 AE. 84 yrs. 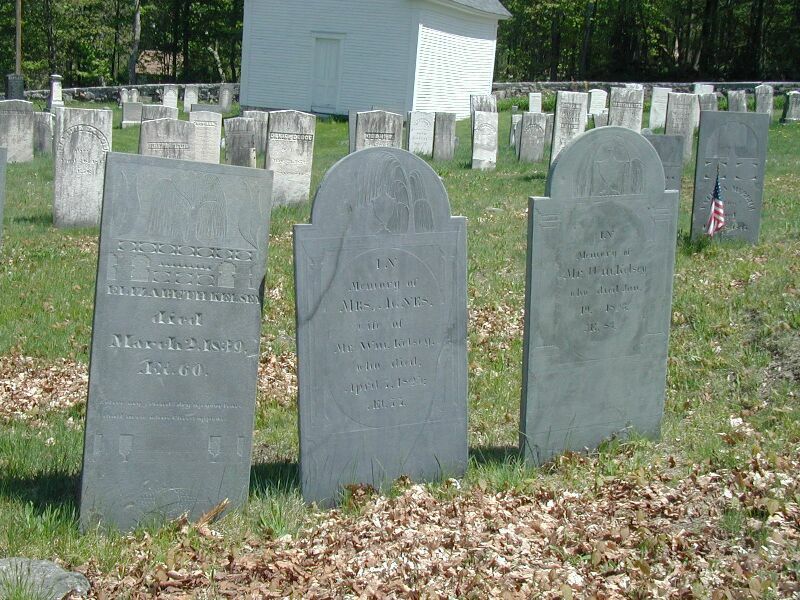 7 ms.
Susannah wife of William Kelso died Apr. 5, 1883 AE. 89 yrs. 7 ms. 17 ds. 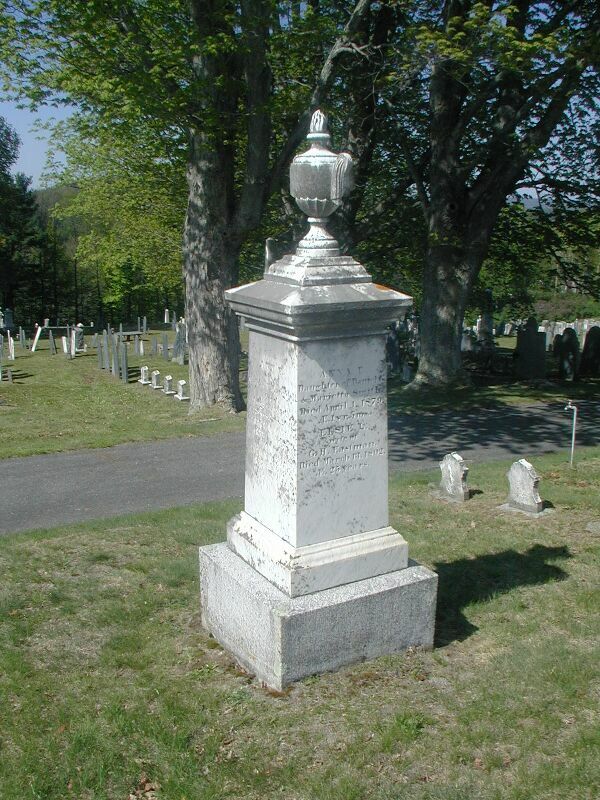 William  Kelso died Oct. 11, 1869 AE. 84 yrs. 7 ms. In memory of Robert Hogg and Mrs. Margaret (Gregg) his wife. 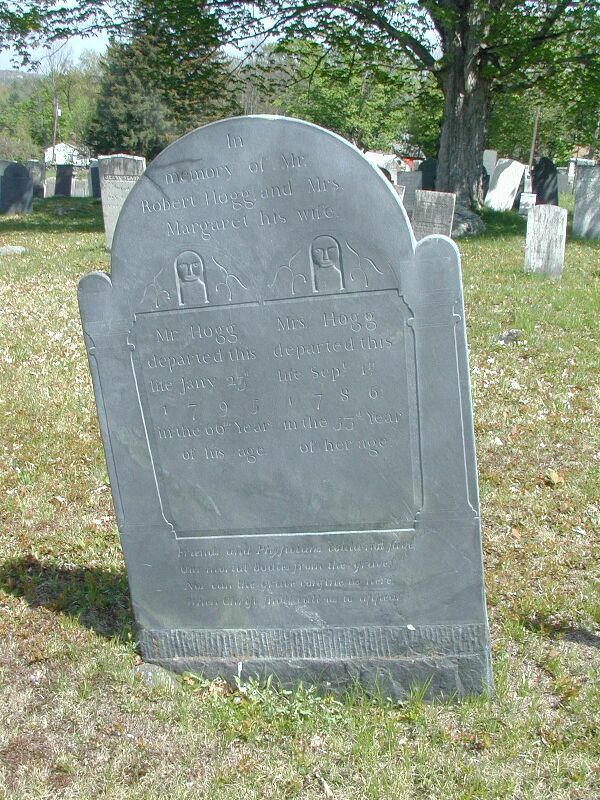 Mr. Hogg departed this life Jany 23, 1793 in the 66th year of his age. 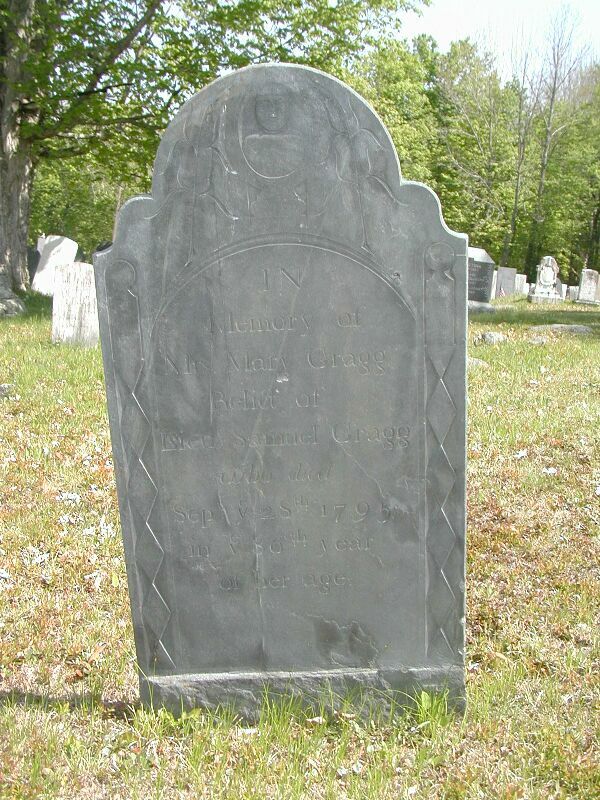 Mrs. Hogg departed this life Sept. 1st in 1786 in the 53rd year of her age. 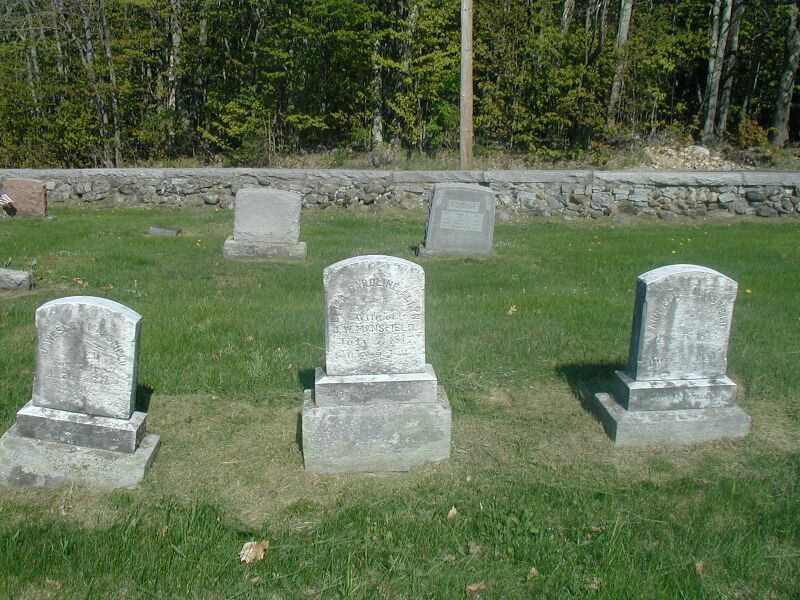 nor can the grave confine us here when Christ shall call us to appear"
dau. 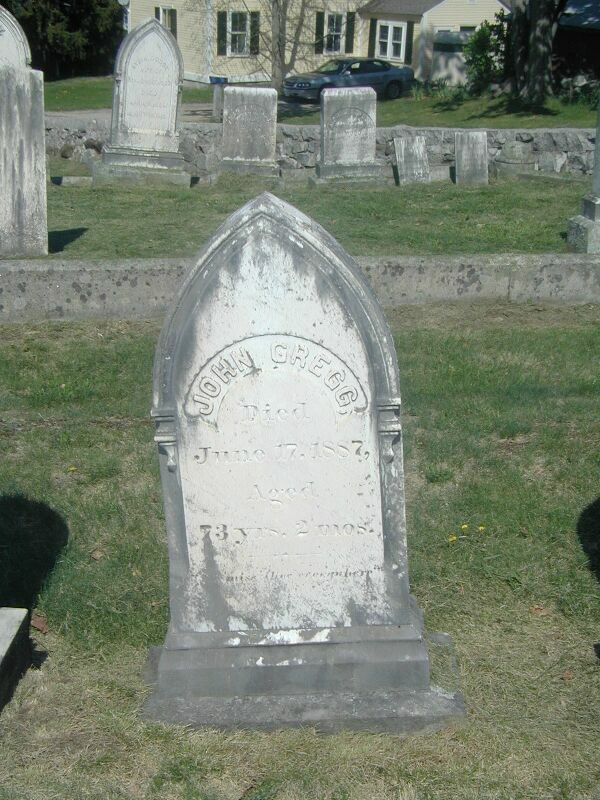 of Robert & Margaret Patterson Jr.
John Shirley died Nov. 26, 1856 AE. 56 yrs. & 2 mos. 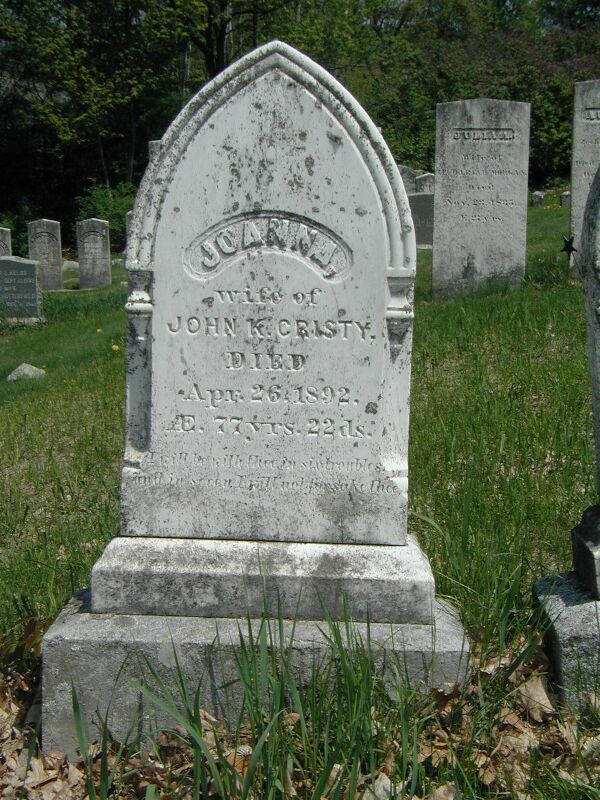 Anna wife of John Shirley died June 27, 1882  AE. 79 y'rs. 4 mo's. & 7 d's. AE. 66 yrs. 8 mos. 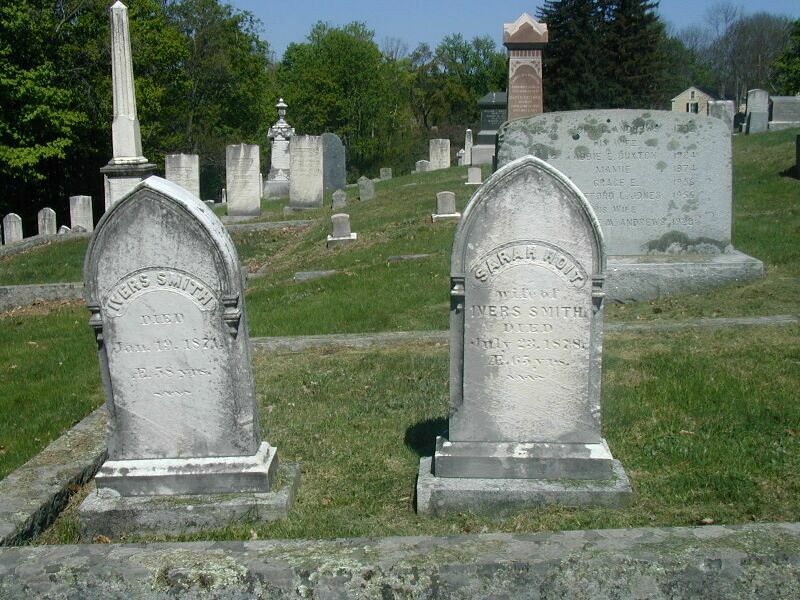 Anna L. (Gove) wife of Thomas Smith died June 26, 1878 AE. 78 yrs. 4 mos. 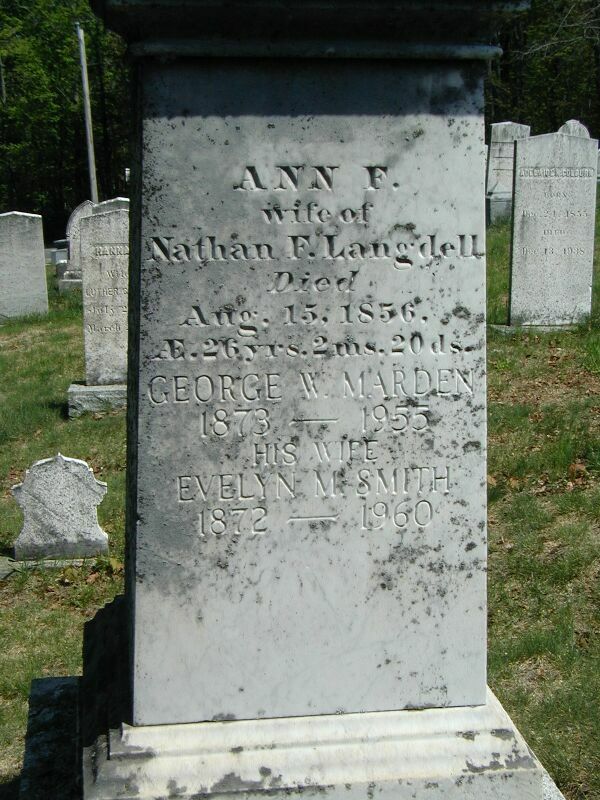 when Christ our Savior shall appear"
Ann F. (Smith) wife of Nathan E. Langdell died Aug. 15, 1856 AE. 26yrs.2ms.20ds. 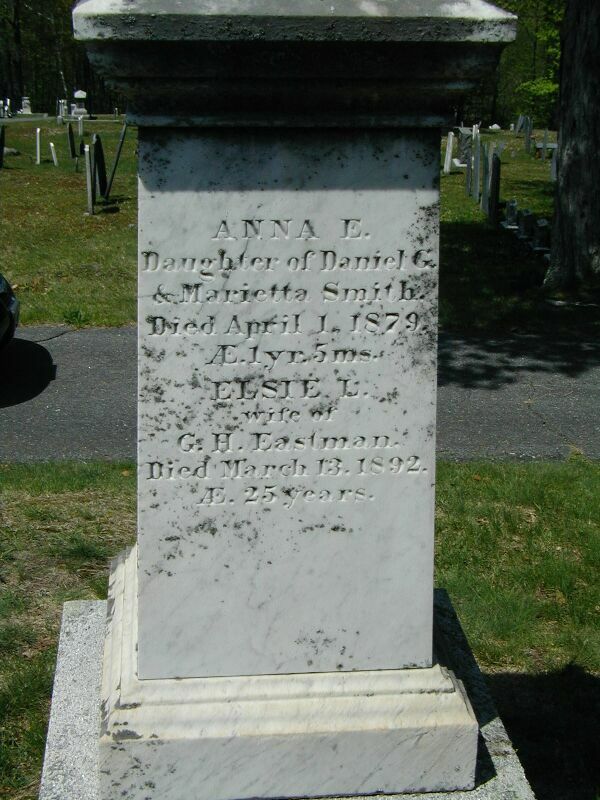 Anna E. daughter of Daniel & Marietta Smith  died April 1, 1879 AE 1 yr. 5 ms.
AE 79 yrs. 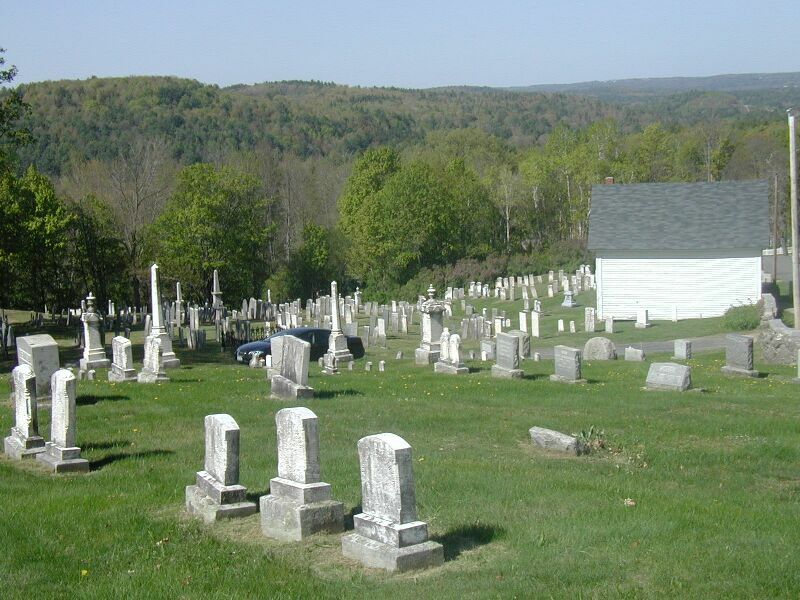 9 ms.
Jane M. wife of Alexander Gregg died Mar. 14, 1876  AE. 73 yrs. 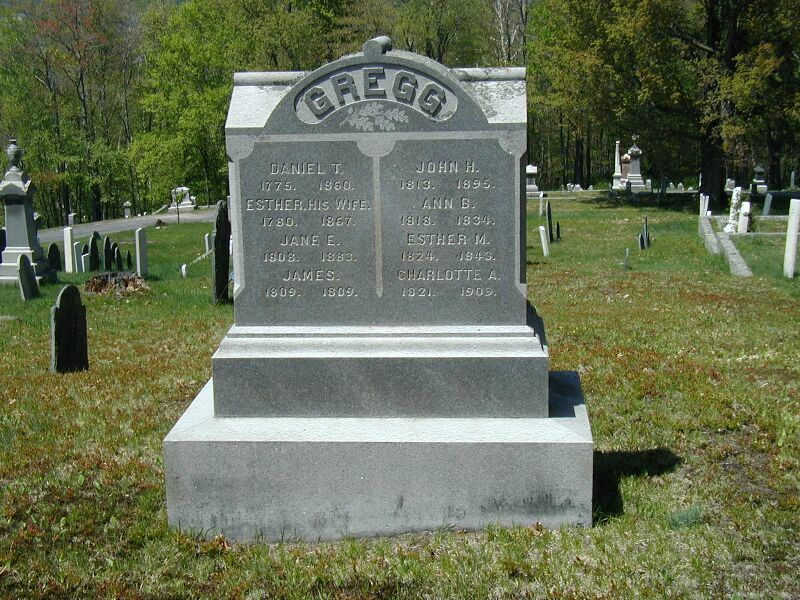 Alexander Gregg died April 2, 1872 AE. 74 yrs. 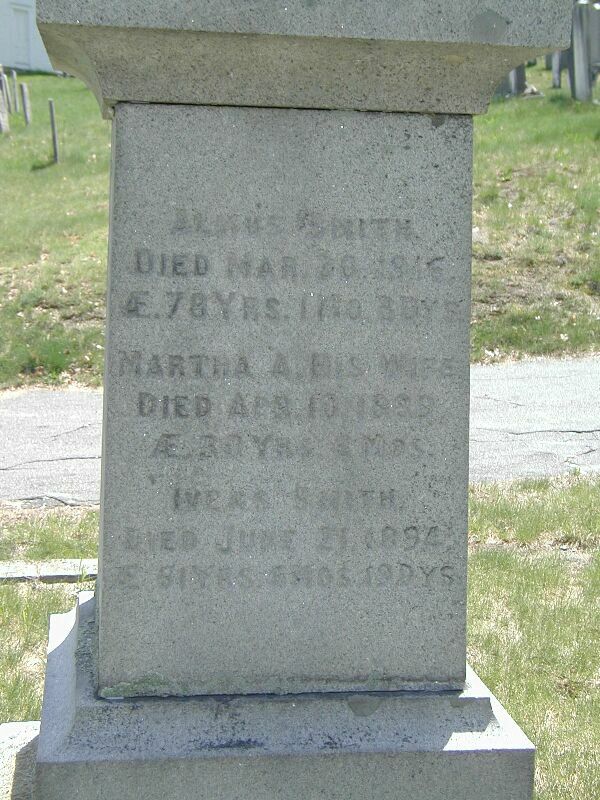 10 ms.
Ivers Smith died Jan. 19, 1871 AE. 58 yrs. Sarah Hoit wife of Ivers Smith died July 23, 1878 AE. 65 yrs. 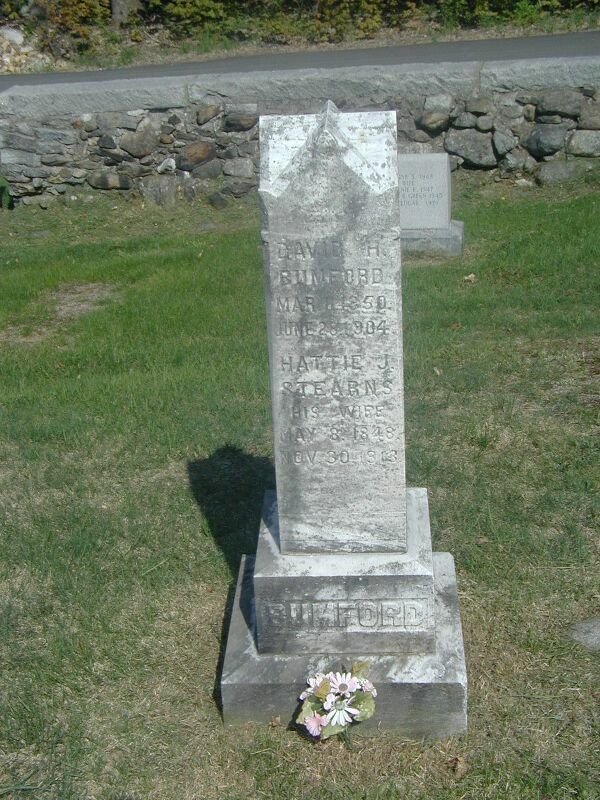 "Father" Elbridge C. Colby died Nov. 9, 1892 AE. 65 yrs. 10 mos. 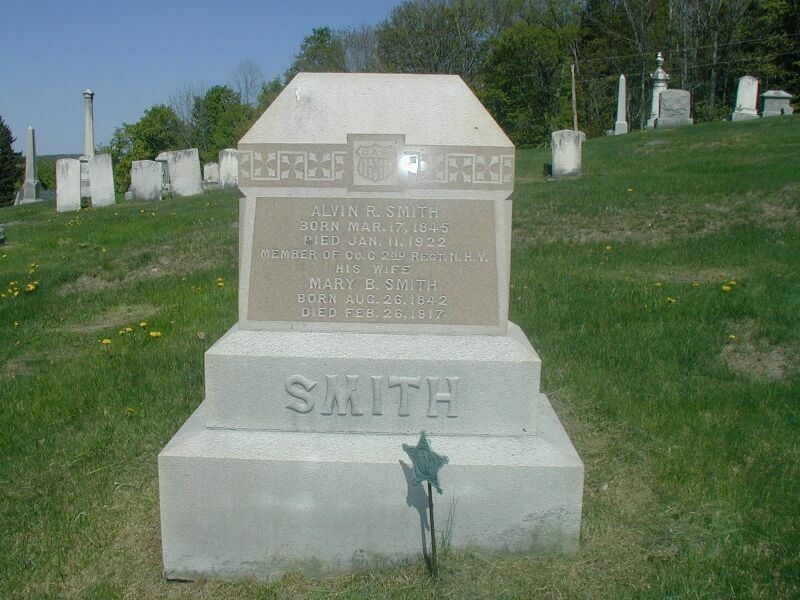 "Mother" Clara S(mith) Colby died Mar. 22, 1896 AE. 54 yrs. 2 mos. 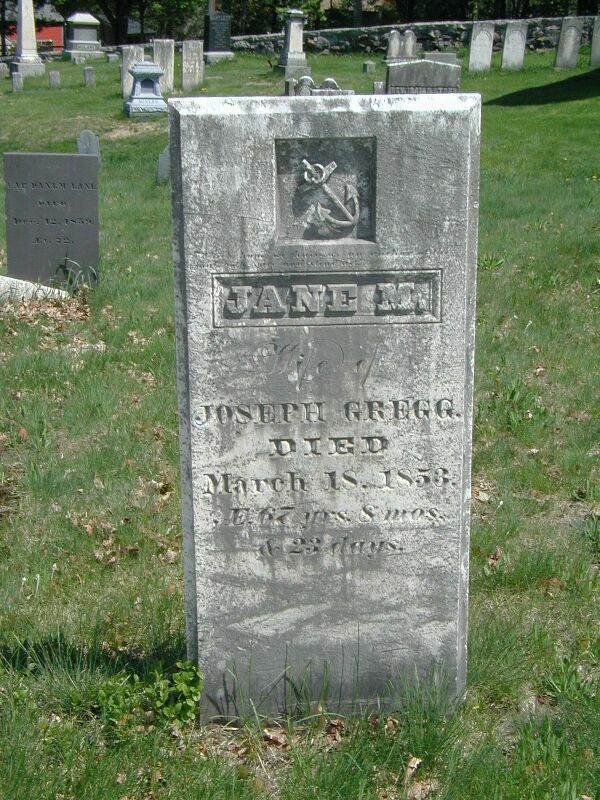 Daniel Gregg died April 2, 1893 AE. 69 yrs. 8 mos. 18 ds. 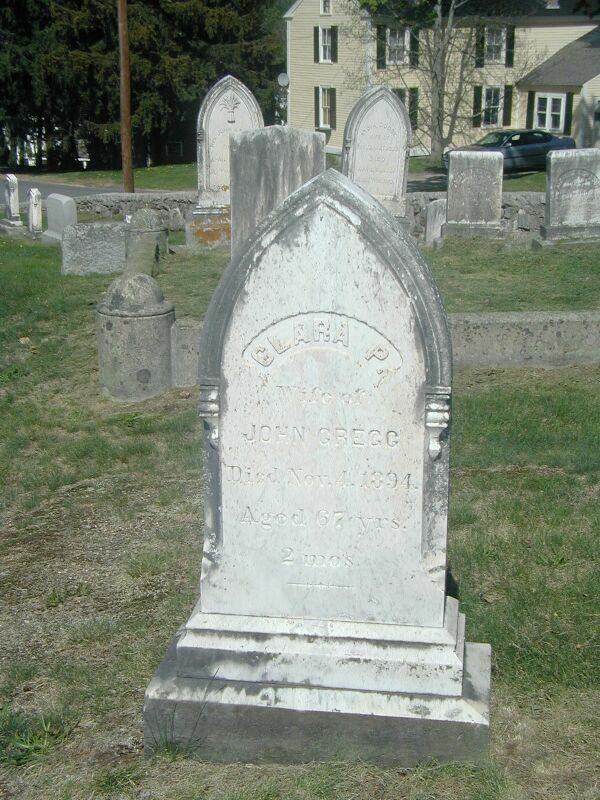 H. Augusta (Young) wife of Daniel Gregg died Jan. 30, 1867 AE. 37 yrs. 8 mos. 8 ds. Mary M. wife of Daniel Gregg died Mar. 23, 1877 AE. 35 yrs. 6 mos. 28 ds. 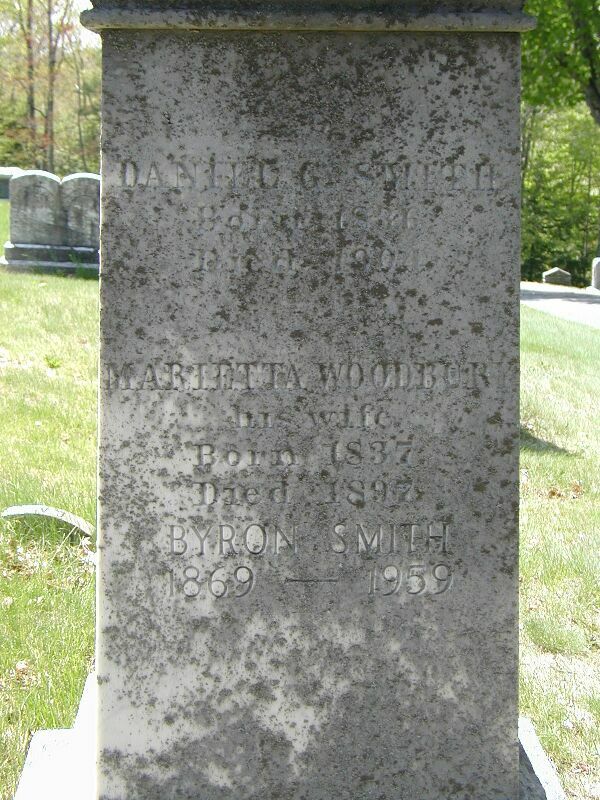 Asenath B(rown) wife of Calvin Fuller died May 1, 1901 AE. 86 yrs. 11 mos. AE. 7 ys. 6 ms. & 25 ds. 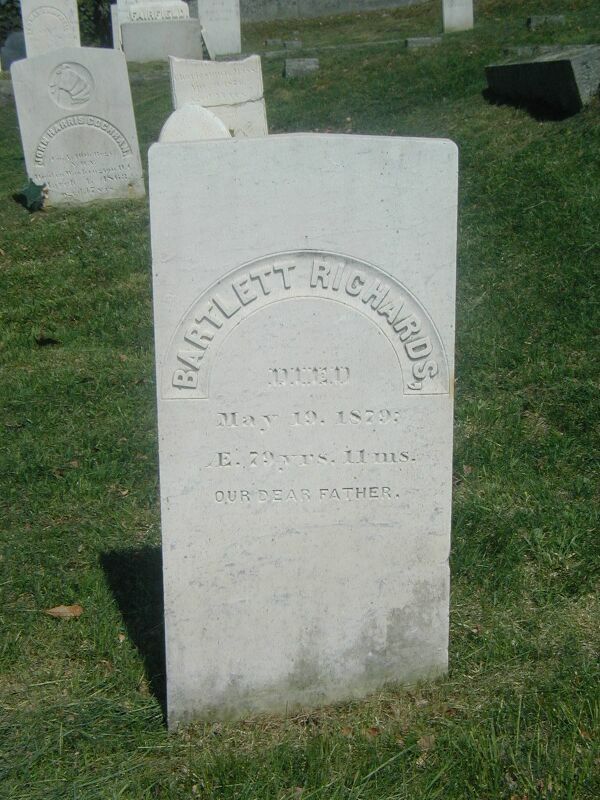 Bartlett Richards died May 19, 1879 AE. 79 yrs. 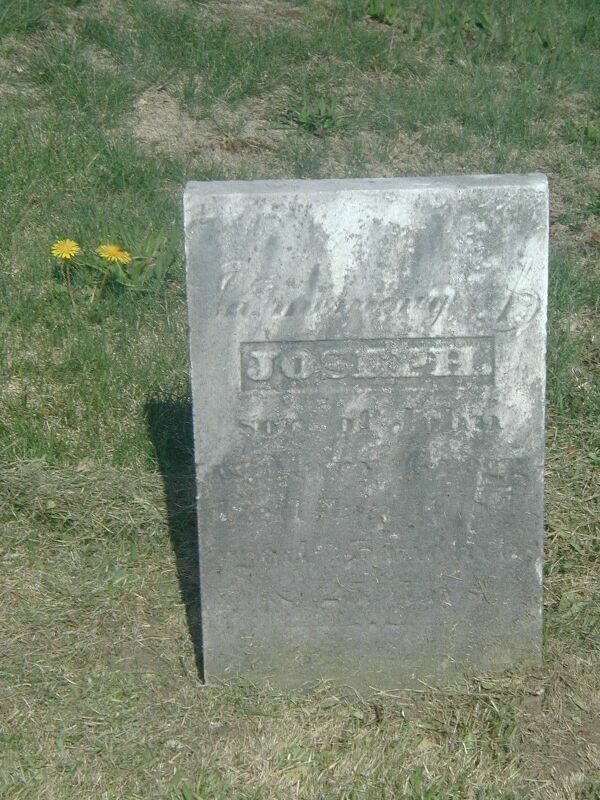 11 ms.
Joseph B. son of Bartlett & Jane Richards died May 24, 1874  AE. 30 yrs. 5 ms.
"Member of Co.C 10th Regt, N.H.V." 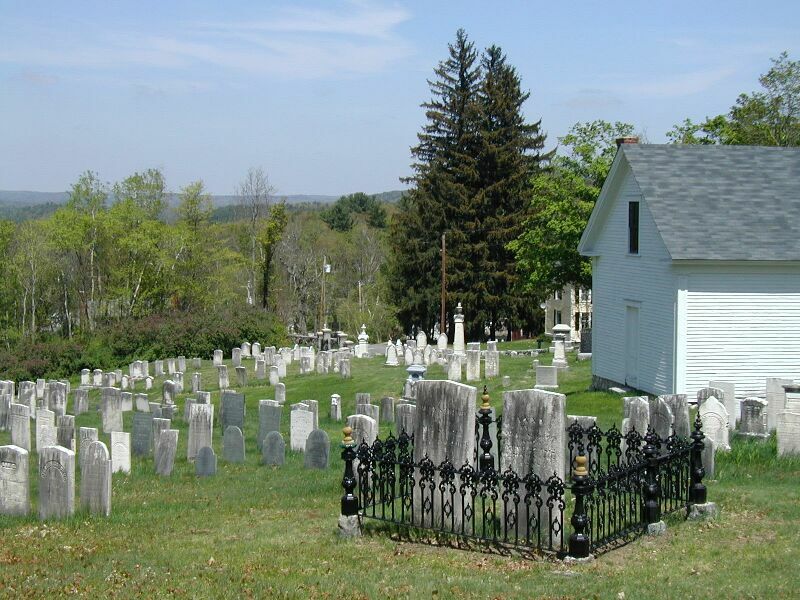 "He served as Elder in the Presbyterian Church Forty years." 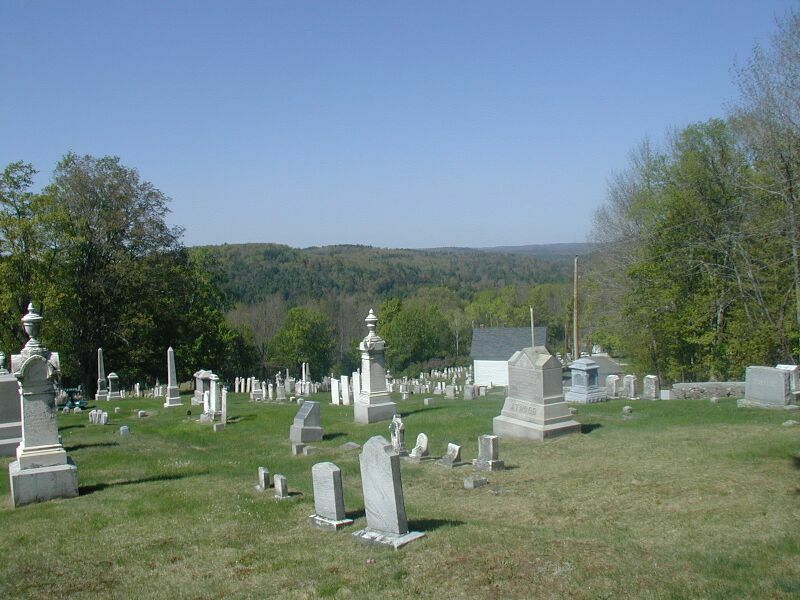 Clarinda (Smith) wife of John McCurdy died Apr. 16, 1883 AE. 73 yrs. 3 ms.
Sarah dau. 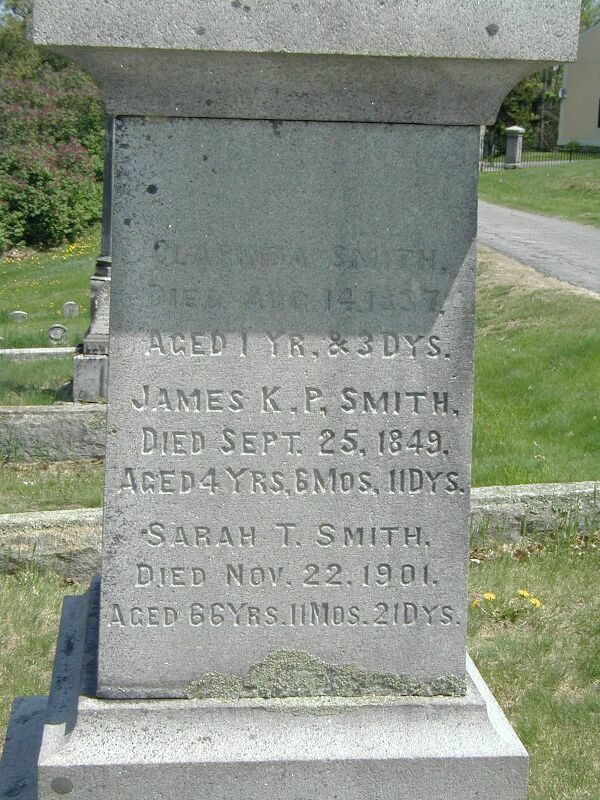 of (C.) Smith & John McCurdy died March 22, 1844 AE. 30 yrs. 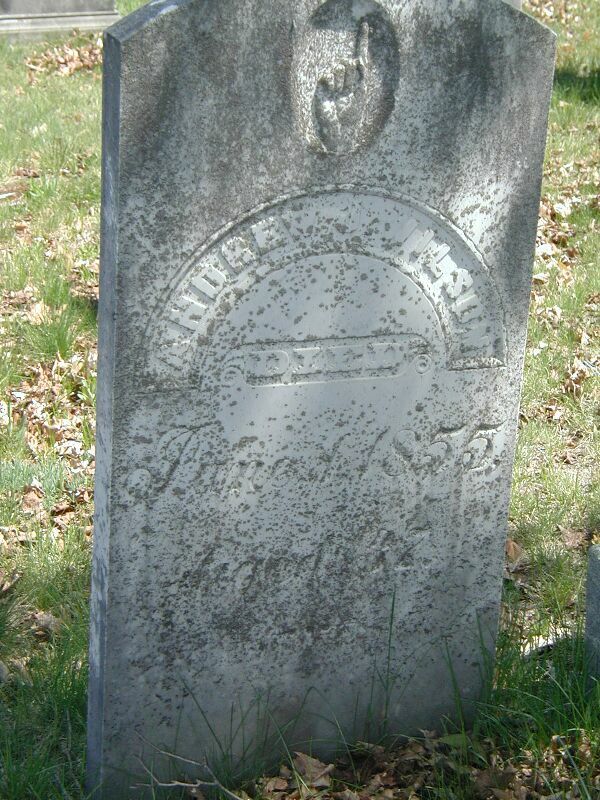 "Member of Co.C 2nd Regt, N.H.V." 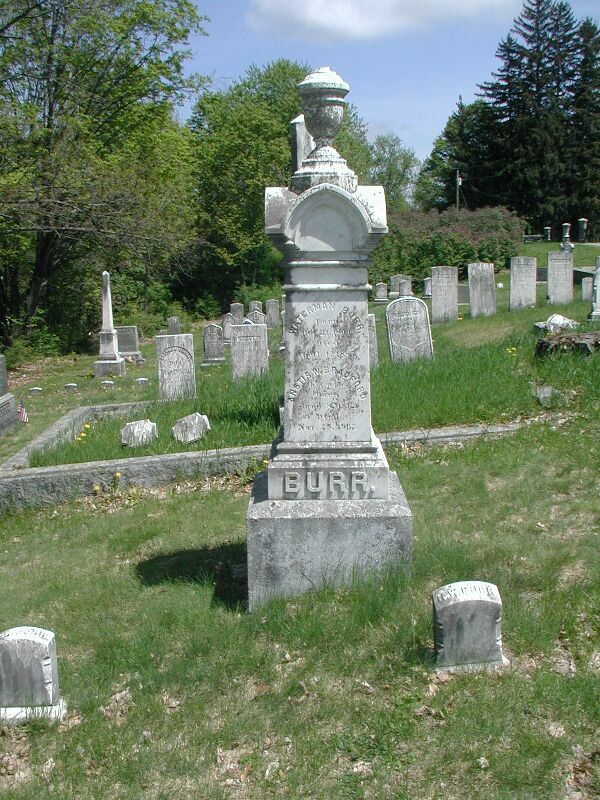 Clara P. wife of John Gregg died Nov. 4, 1894 Aged 67 yrs. 2 mos. 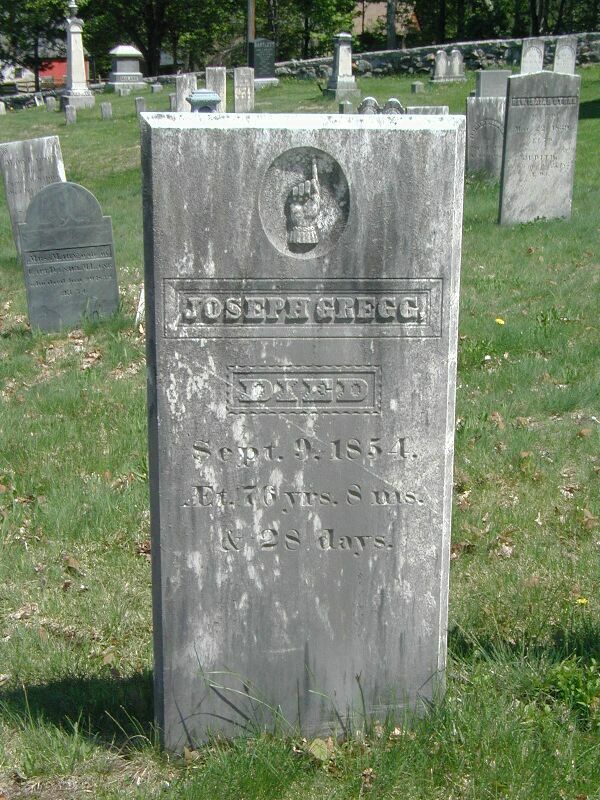 John Gregg died June 17, 1887 aged 73 yrs. 2 mos. 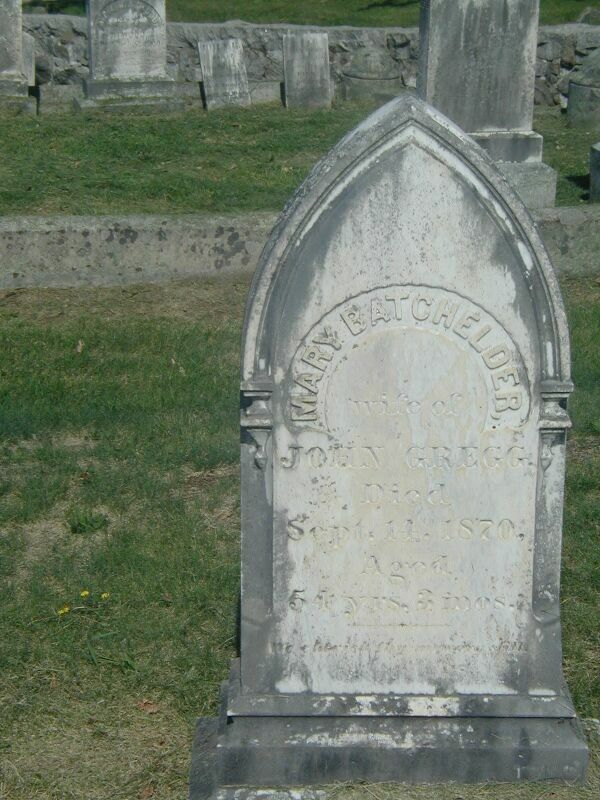 Mary Batchelder wife of John Gregg died Sept. 14, 1870 Aged 55 yrs. 3 mos. J. Wesley Mansfield died Nov. 17, 1889 AE. 76 yrs. 7 mos. 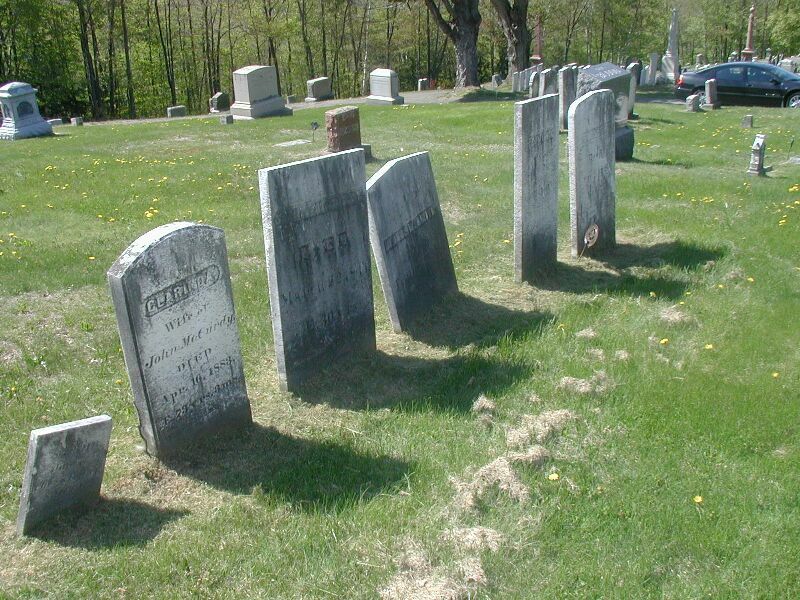 "Colonial Gravestone Inscriptions in the State of New Hampshire"
Beard, Joseph, d. June 18, 1794, ae. 37 yrs. 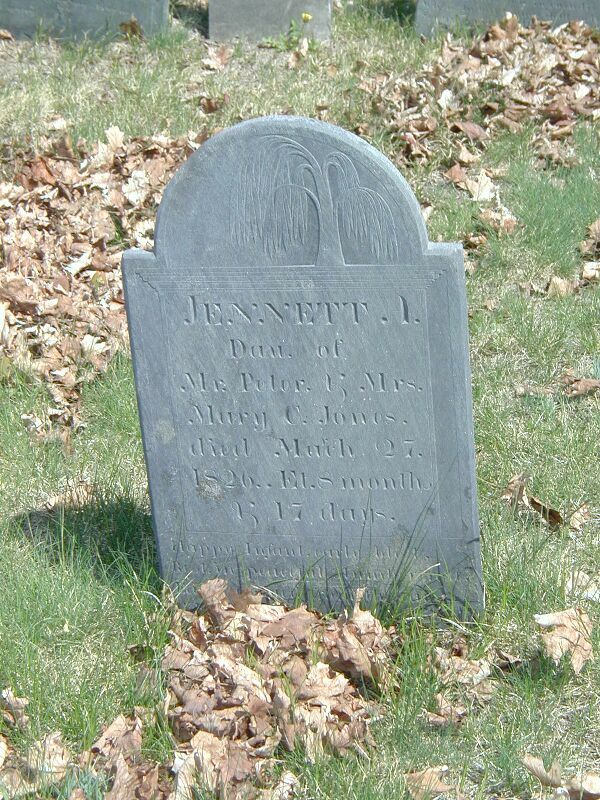 Betton, Anna, D. Nov. 23, 1790, in her 36th year. 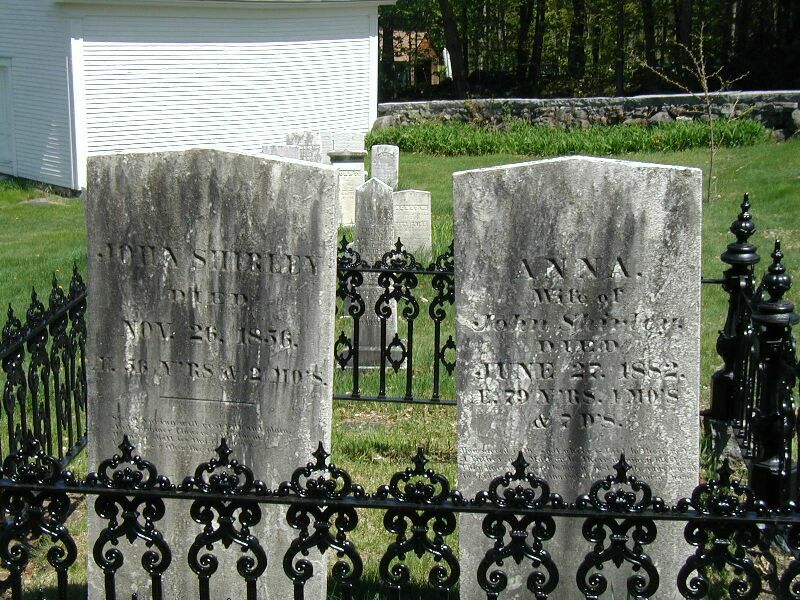 Betton, Samuel, d. Oct. 9, 1790 in his 35th year. Boyd, Robert, d. Apr. 29, 1812, ae. 68 yrs. 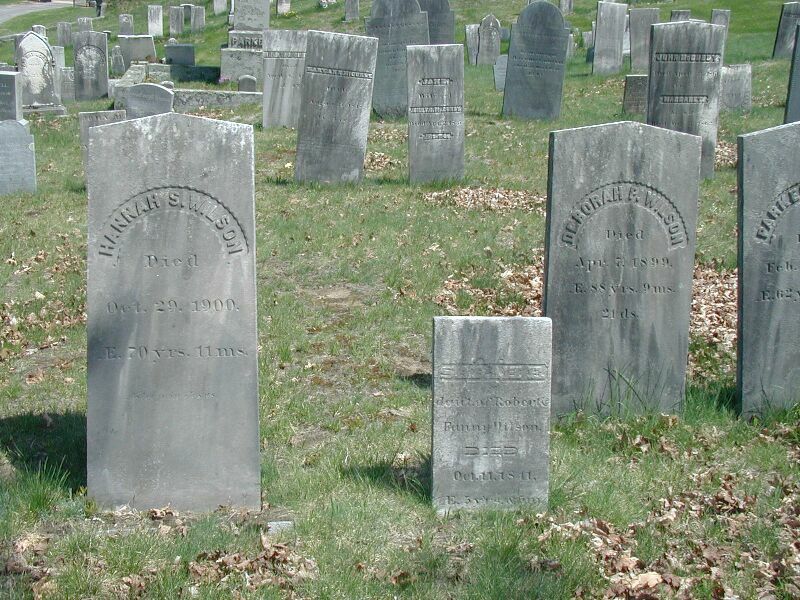 Boyd, Mary, w. of Robert, d. Jan. 1, 1827, ae. 80 yrs. Caldwell, Anna, w. of James, Esq. d. July 2, 180-, ae. 56 yrs. 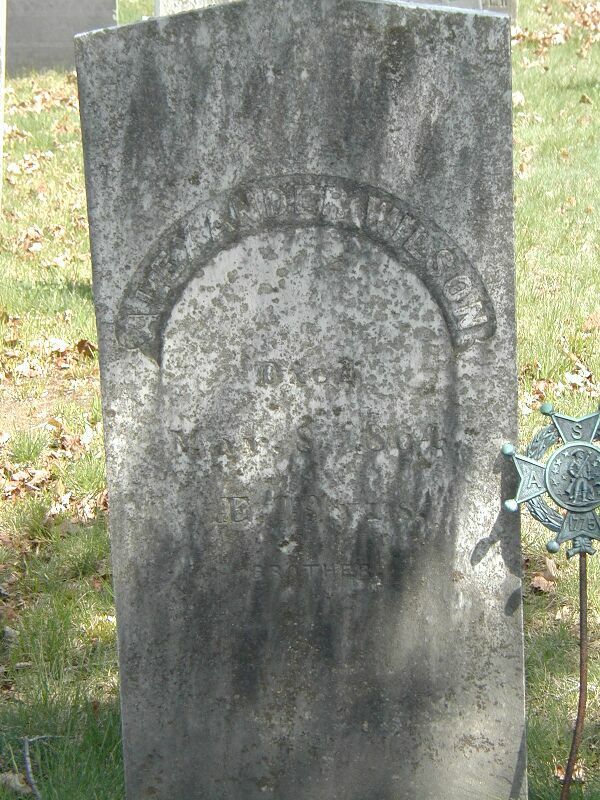 Caldwell, James, d. Feb. 25, 1824, ae. 83 yrs. 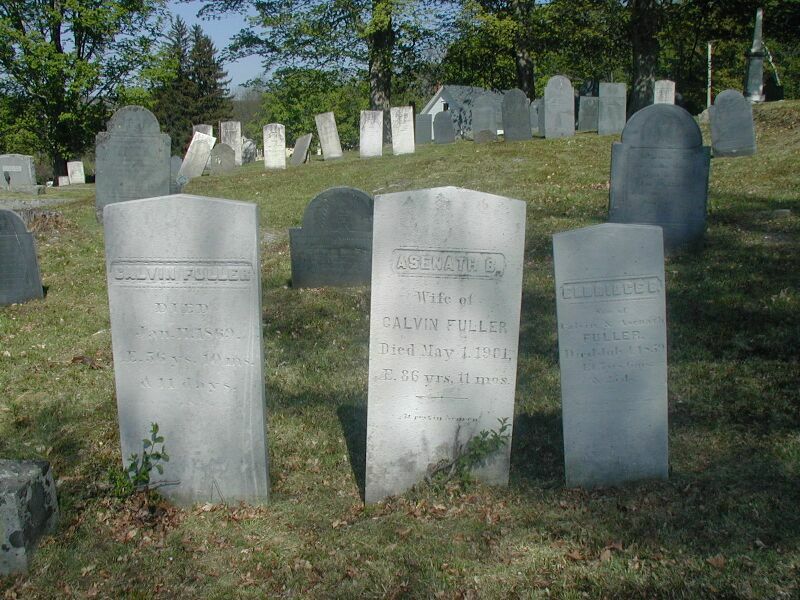 Caldwell, Martha, w. of James, d. June 15, 1808, ae. 55 yrs. 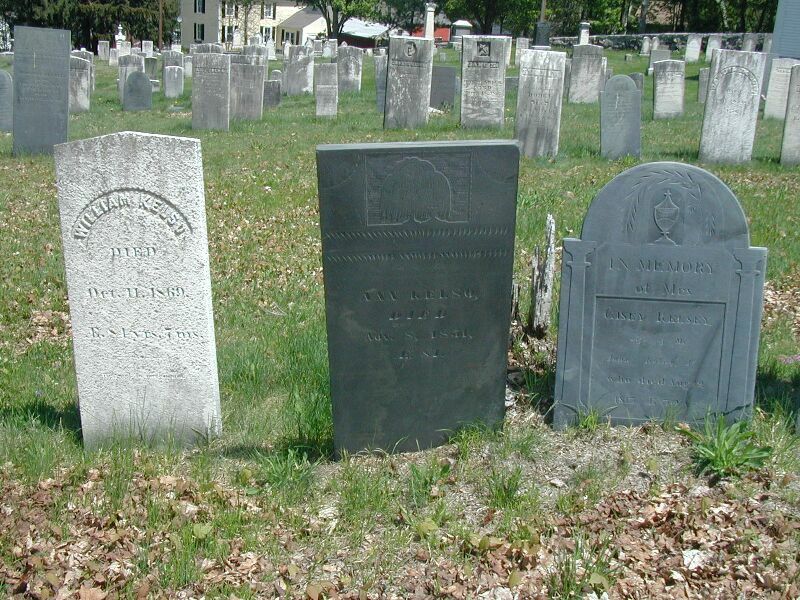 Cochran, Martha, w. of John, Esq., d. Mar. 16, 1843, ae. 92 yrs. Cochran, Mrs. Anna, d. Apr. 28, 1795, ae. 25 yrs. Cochran, Elizabeth, 2nd w. of James, d. May 14, 1808, ae. 46 yrs. Cochran, John, Esq. d. June 3, 1805, ae.60 yrs. Cochran, Martha, w. of John, Esq. d. Mar. 16, 1848, ae. 92 yrs. Cochran, Elijah, d. Jan. 15, 1850, ae. 97 yrs. 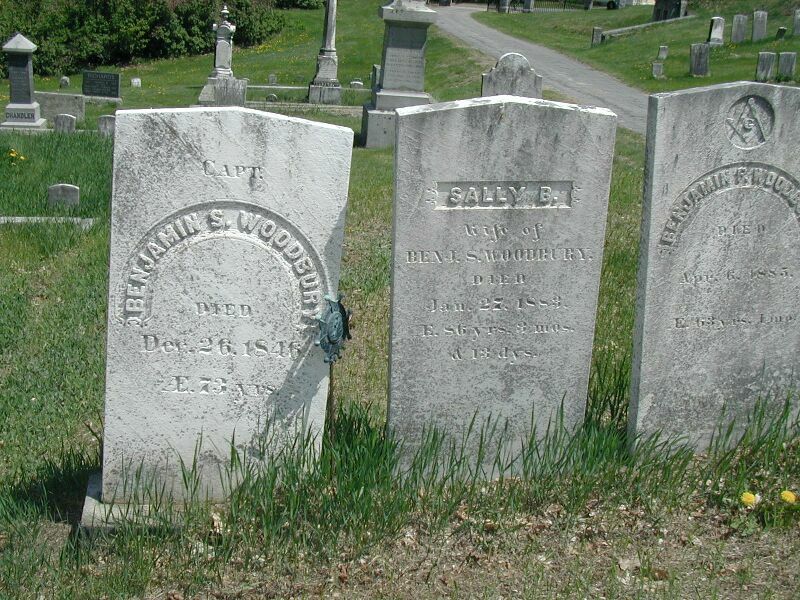 Cochran, Jemima, w. of Elijah, d. Aug. 27, 1835, ae. 80 yrs. Cochran, Elizabeth, 2nd. 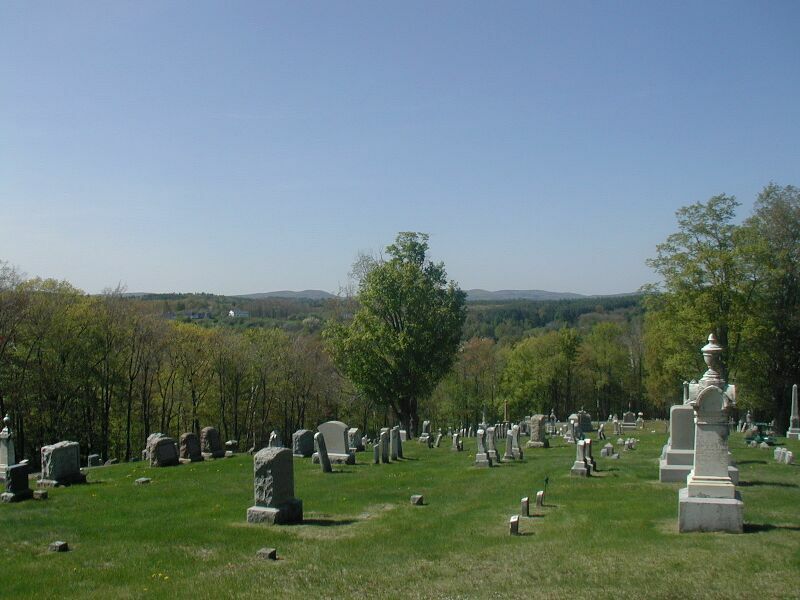 w. of Nathaniel, d. July 16, 1796, ae. 70 yrs. Crombie, Robert, d. Apr. 21, 1830, ae. 61 yrs. 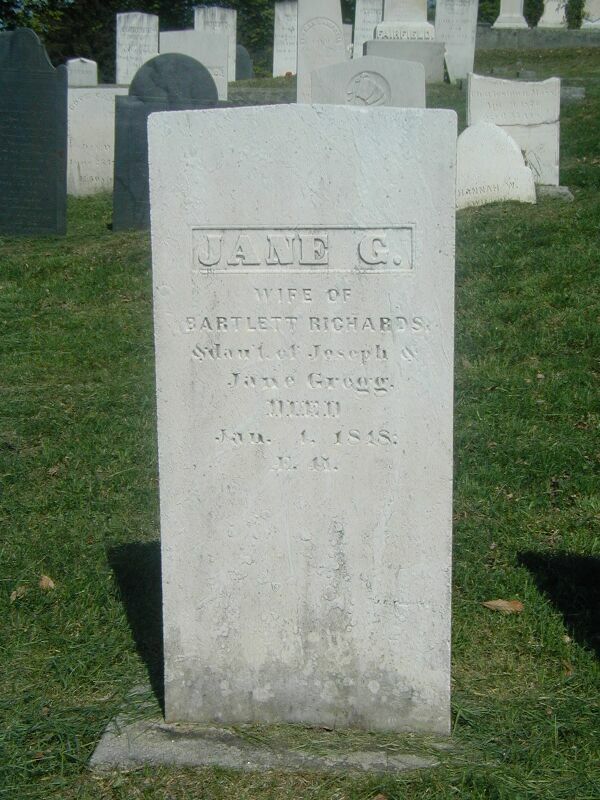 Crombie, Jane, d. Jan. 7, 1814, ae. 30 (80?) yrs. 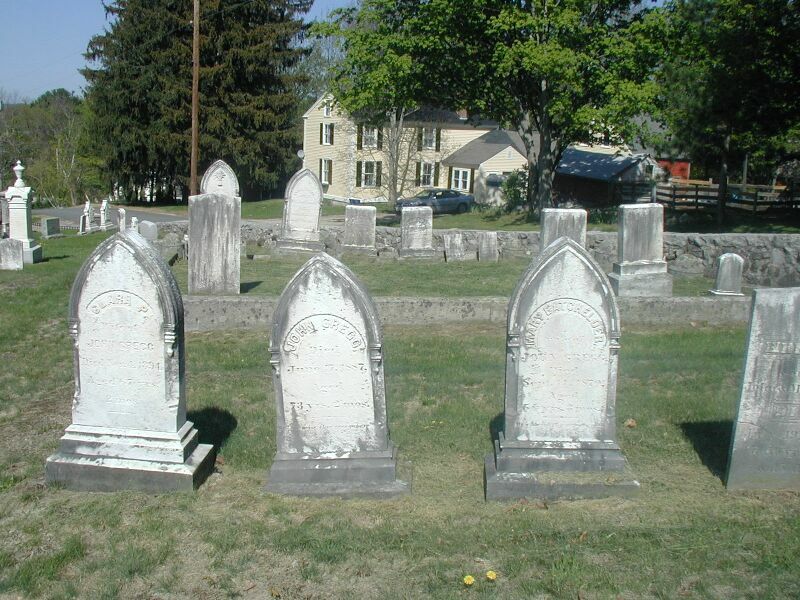 Clark, Ann, w. of William, d. June 12, 1792, ae. 56 yrs. Clark, William, d. Mar. 9, 1808, ae. 74 yrs. 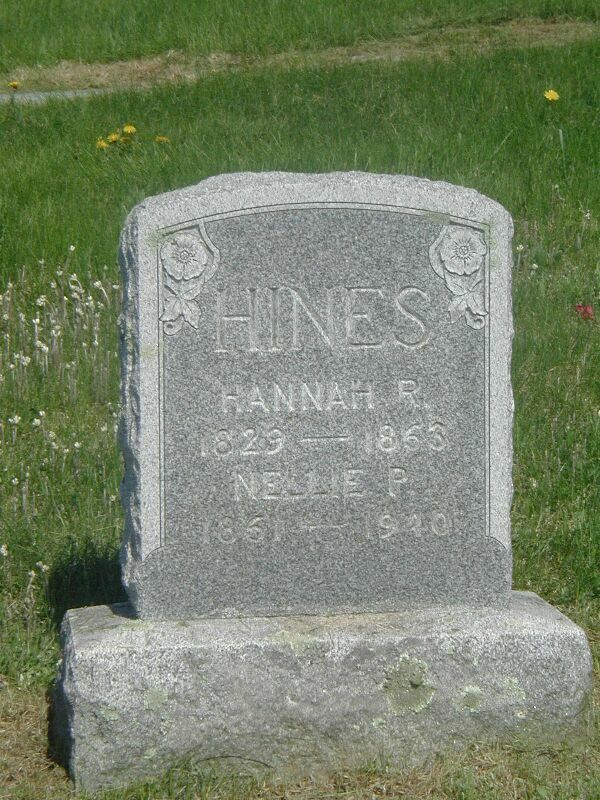 Clark, Ninian, d. May 25, 1828, ae 88 yrs. 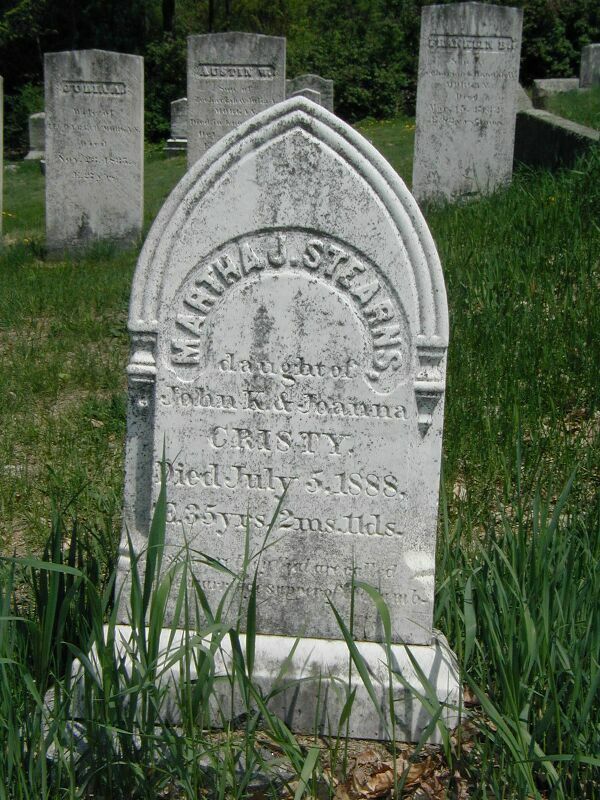 Christy, Mrs. Mary, d. Jan. 14, 1808, ae. 64 yrs. Christy, Capt. George, d. Apr. 22, 1790, in his 58th year. Christy, Margaret, d. Mar. 13, 1799, in her 62nd year. 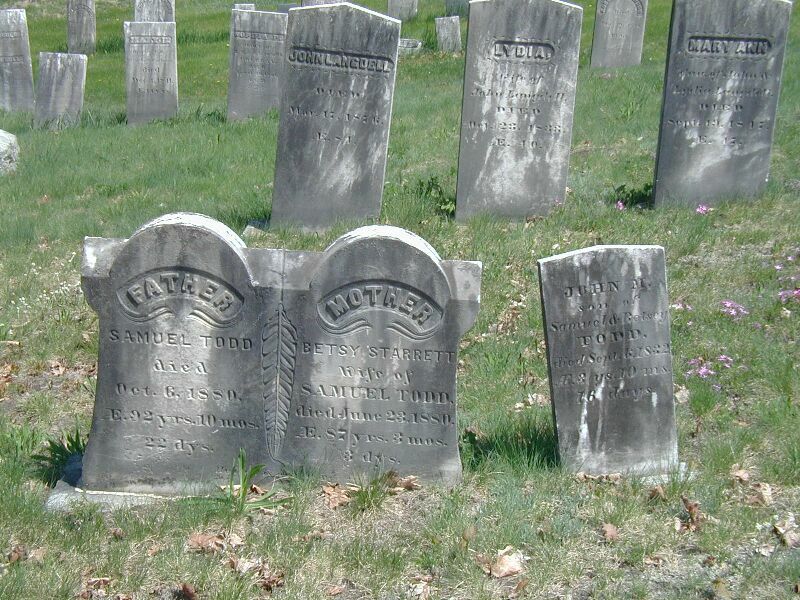 Dickey, Janet, d. June 11, 1811, ae. 69 yrs. Dodge, Sarah, dau. of James Caldwell, d. May 6, 1829, in her 42nd year. 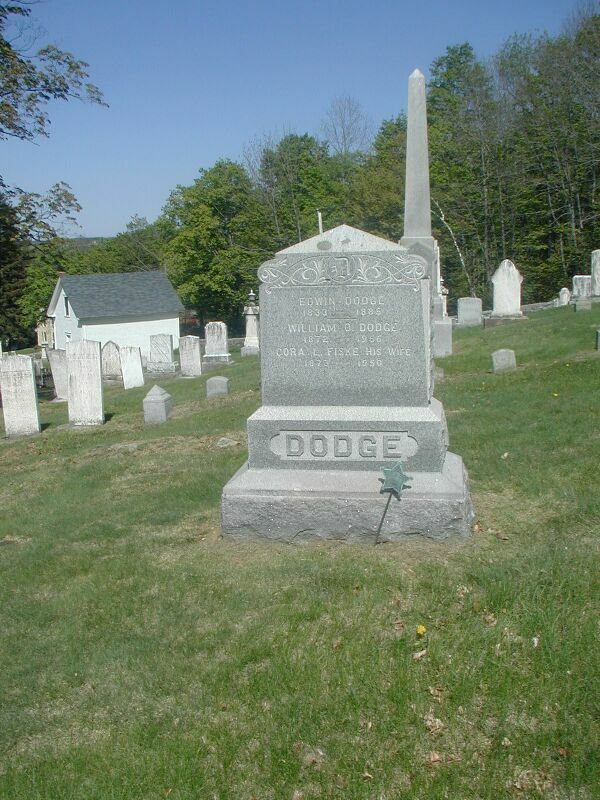 Dodge, Nathaniel, d. Nov. 12, 1818, ae. 63 yrs. 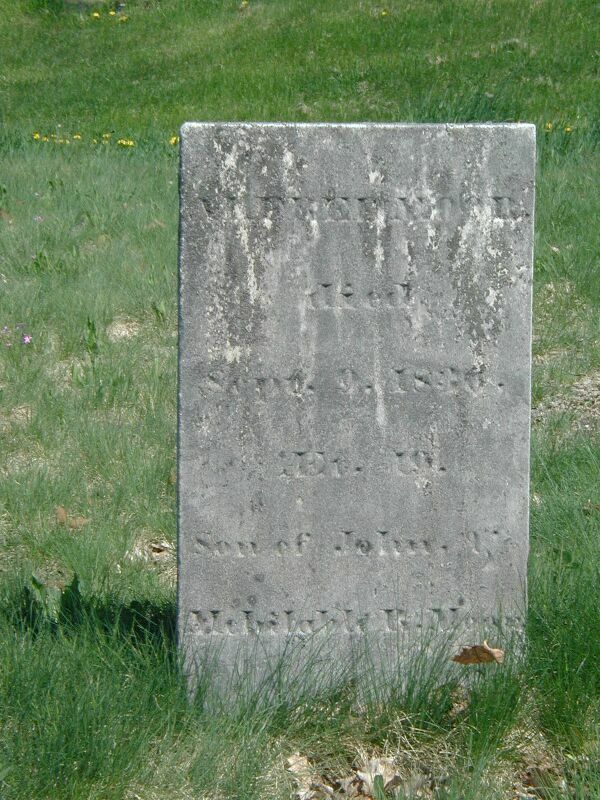 Dodge, Sarah, w. of Nathaniel, d. June 18, 1815, ae. 62 yrs. 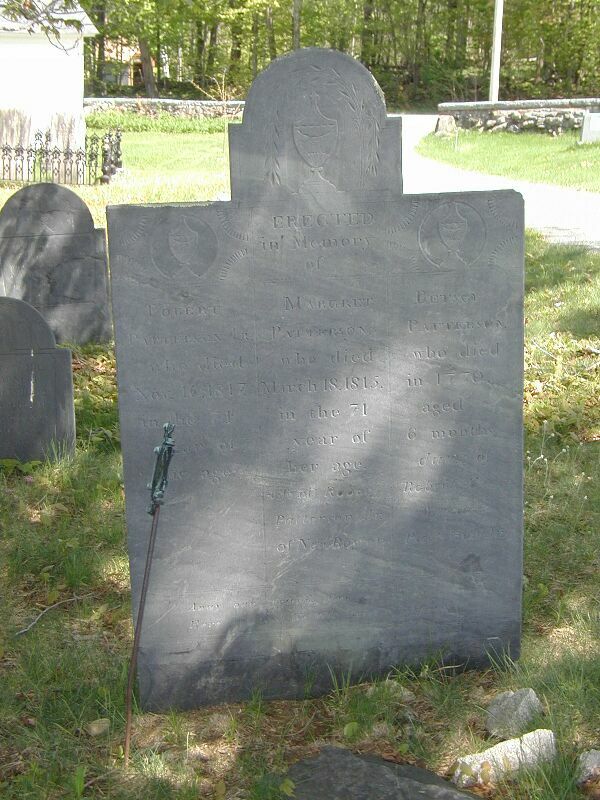 Gove, Mary, w. of Dr. Jonathan, d. Sept. 26, 1788 in her 41st year. Hall, Nathan, d. Nov. 9, 1877, ae. 80 yrs. 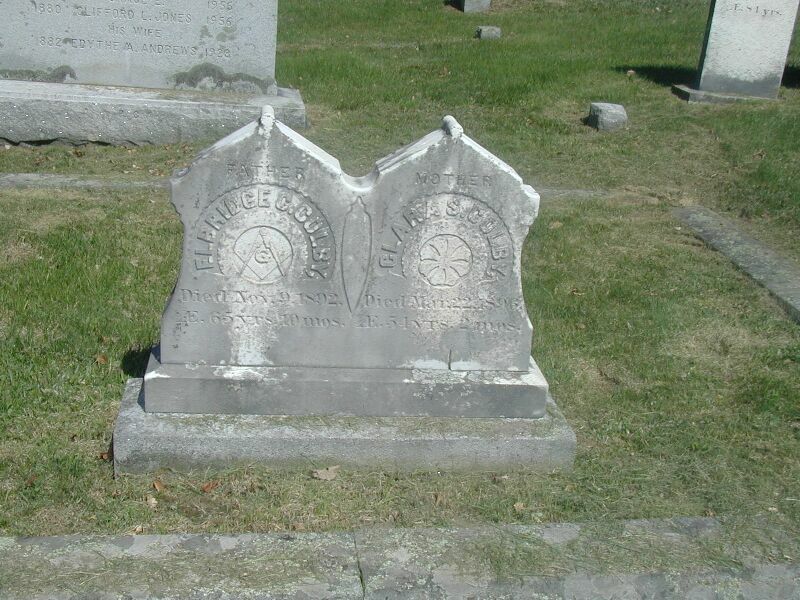 Maurice and Catherine Lynch, d. June (? ), 1802, ae. 30 yrs. 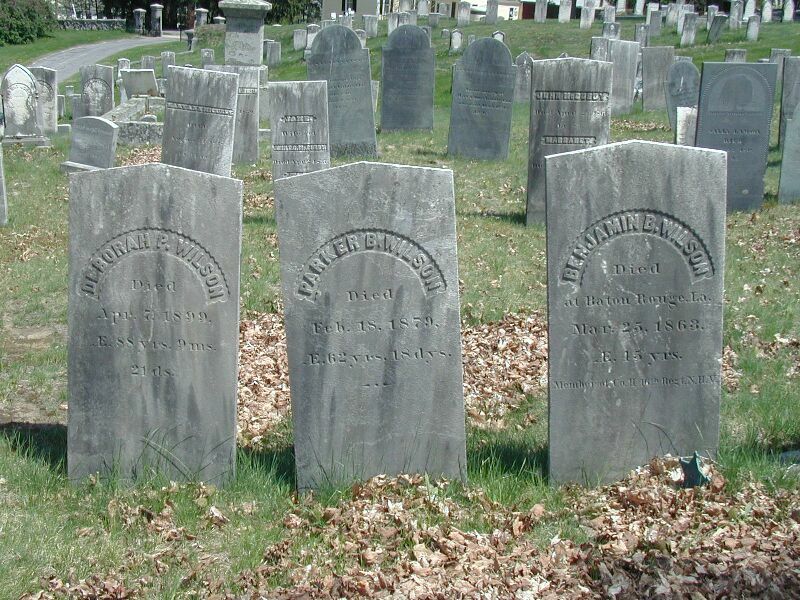 Hogg, Robert, b. Ireland, d. Jan. 28, 1795, ae. 66 yrs. 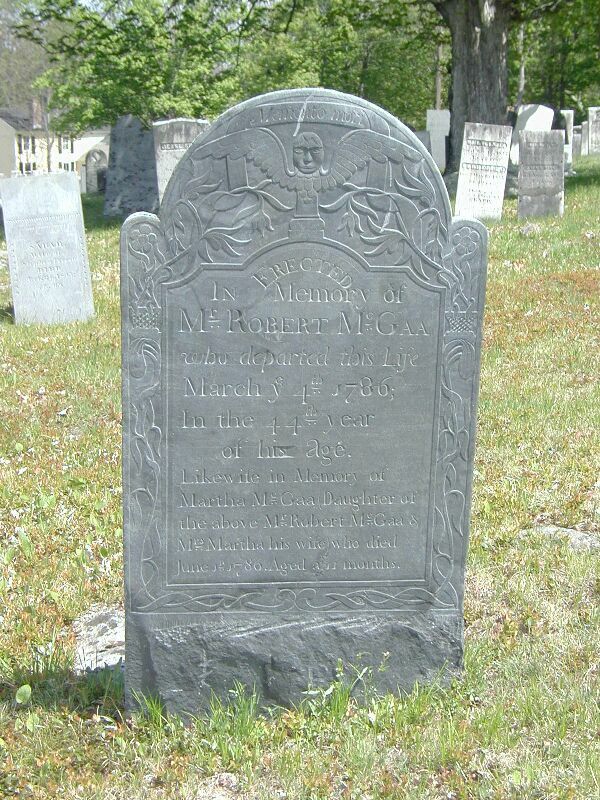 Hogg, Margaret, w. of Robert, d. Sept. 1, 1786, ae. 53 yrs. 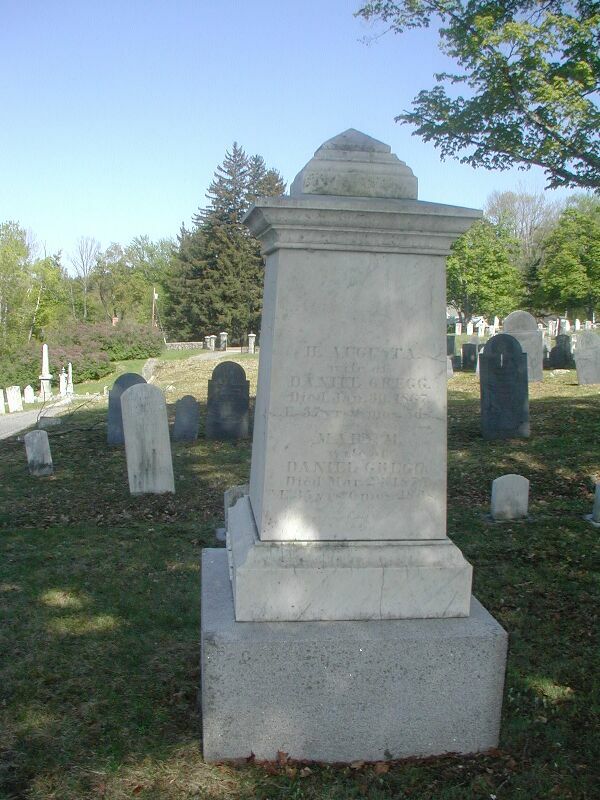 Hogg, Abner, b. Derry, Feb.15, 1759, d. Oct. 16, 1856. Revolutionary War. 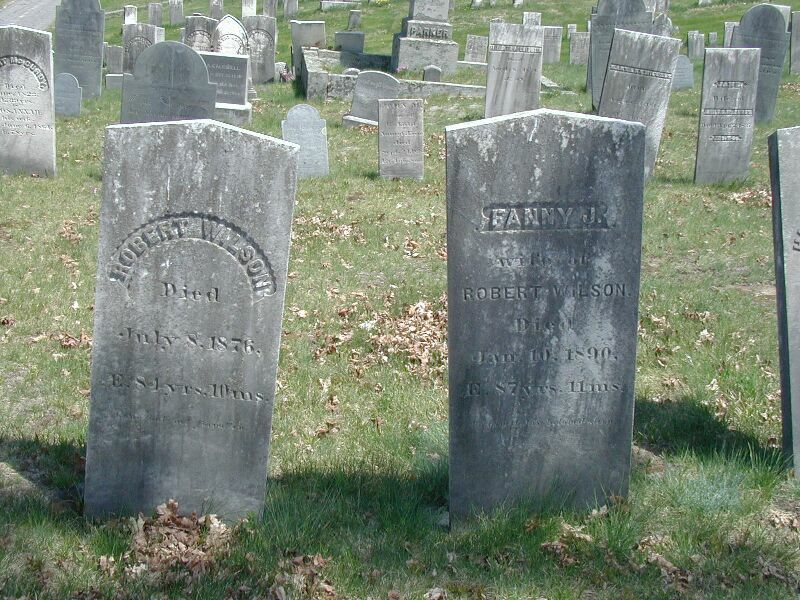 Henry, John, d. Dec. 1813, ae. 71 yrs. 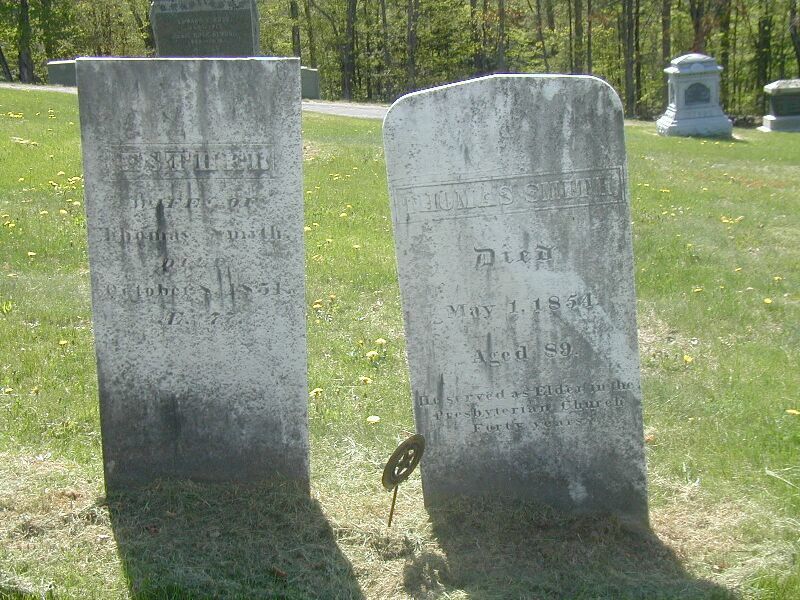 Henry, Martha, d. May 5, 1821, ae. 65 yrs. Jack, Andrew, d. Oct. 10, 1789, in his 75th year. Jan. 13, 1854, ae. 17 yrs. 9 mos. 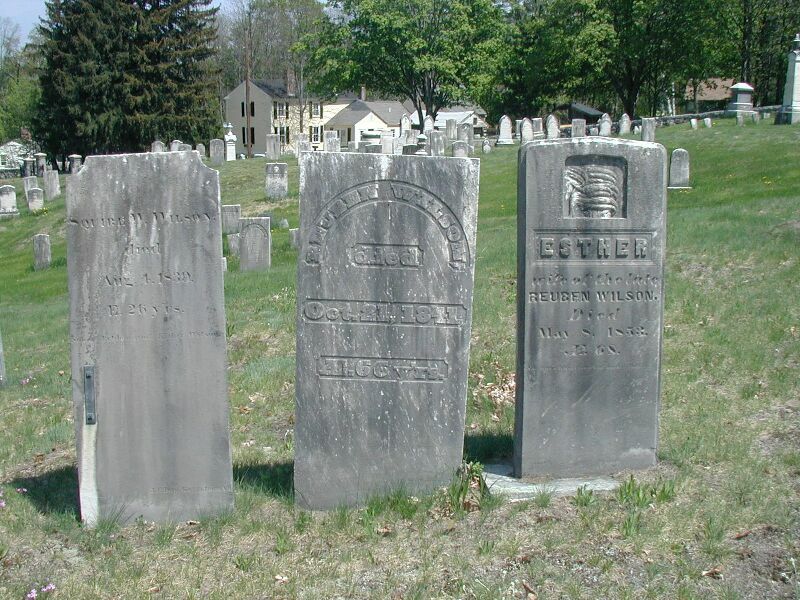 Kelson, Daniel, d. Dec. 24, 1816, ae. 78 yrs. 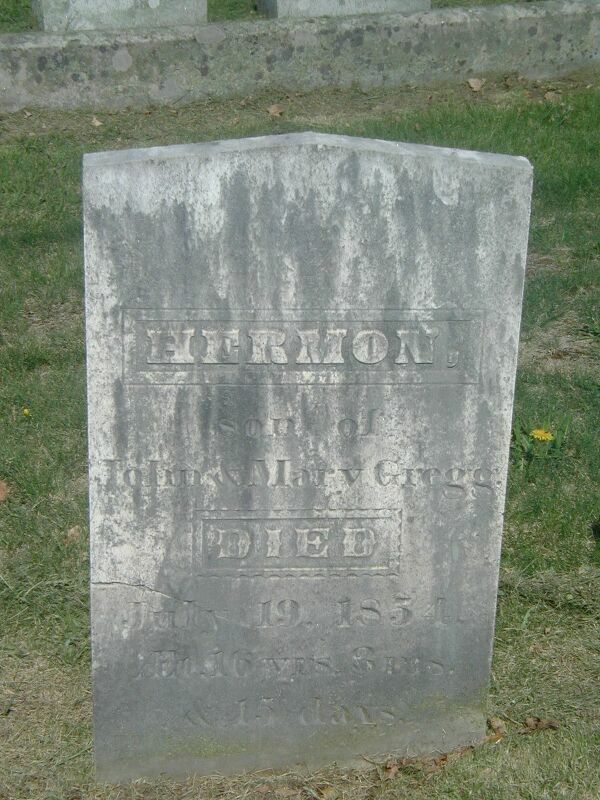 Kelson, Mary, d. Feb. 6, 1816, ae. 79 yrs. Leach, Mary, w. of Joseph, Jr. d. Nov. 8, 1818, ae. 55 yrs. 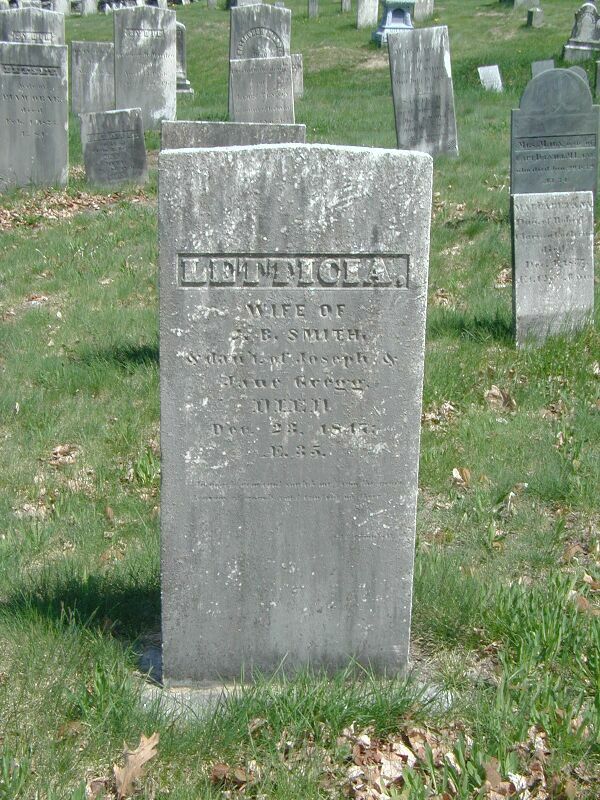 Lynch, John, d. Feb. 17, 1840, ae. 78 yrs. 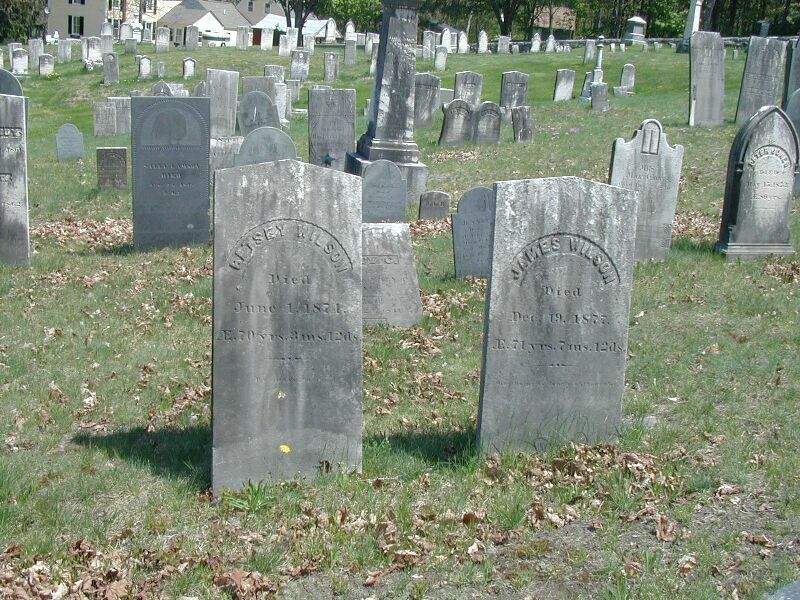 Lynch, Alice, w. of John, d. Sept. 5, 1829, ae. 58 yrs. Lynch, Catherin, w. of Maurice, d. Mar. 5, 1805, ae. 60 yrs. Livingston, Robert, d. Mar. 4, 1786, ae. 68 yrs. 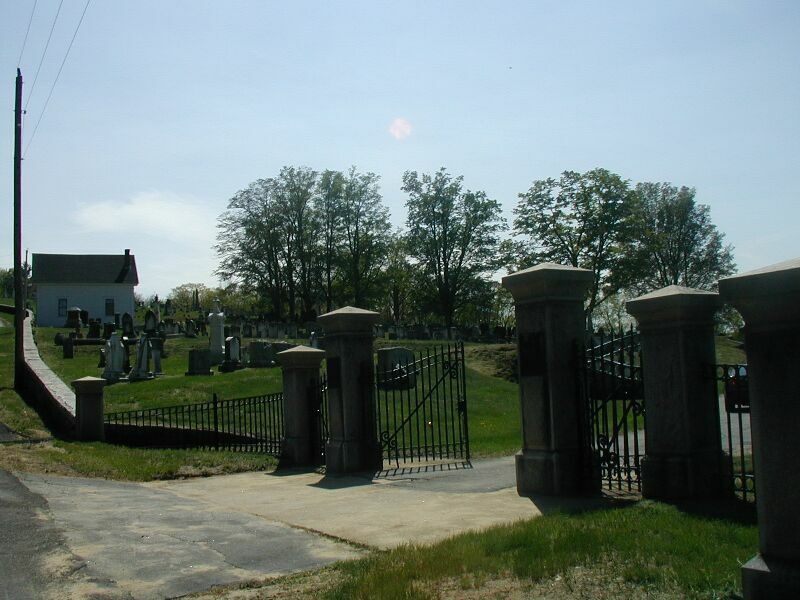 Moor, Ann, w. of Rev. Solomon, d. Nov, 22, 1842, ae. 96 yrs. 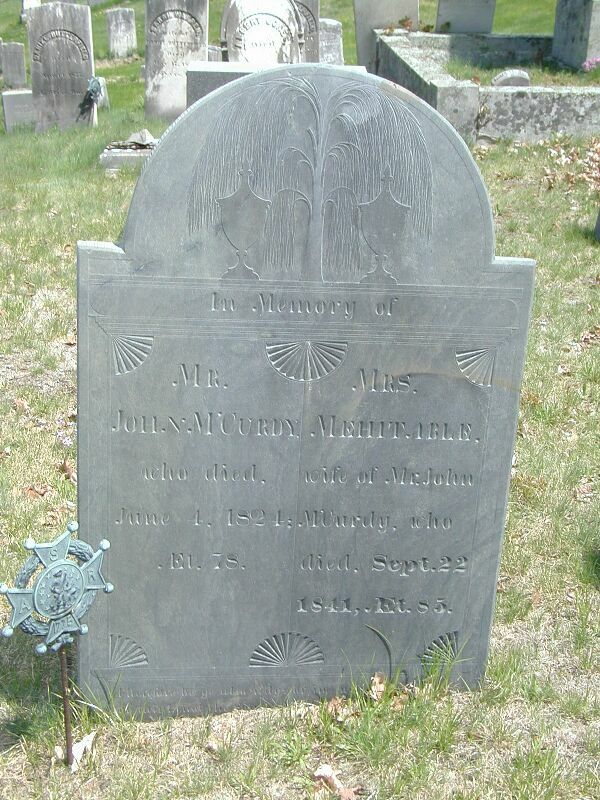 Moor, Allan, d. Feb. 18, 1811, ae. 84 yrs. McCollom, Elisabeth, d. Mar. 2, 1814 ae. 83 yrs. 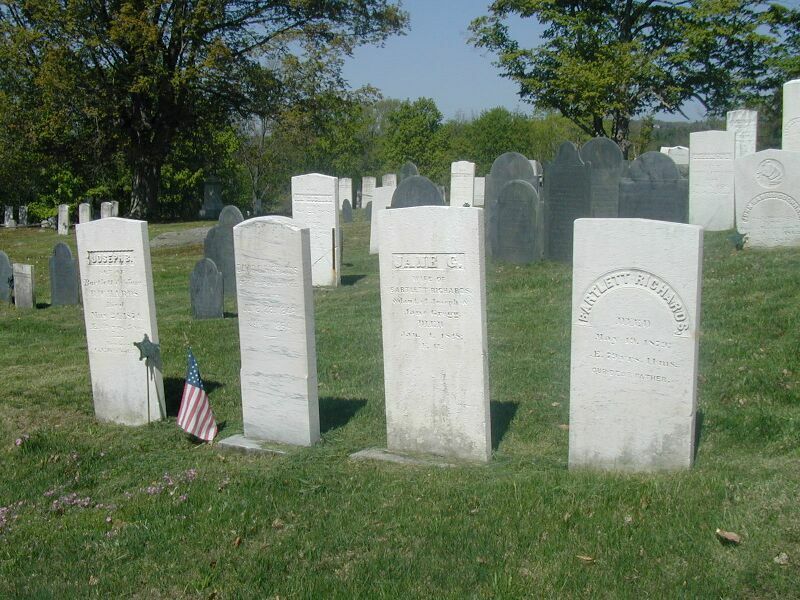 McCollom, Alexander, d. Jan. 7, 1768, ae. 36 yrs. 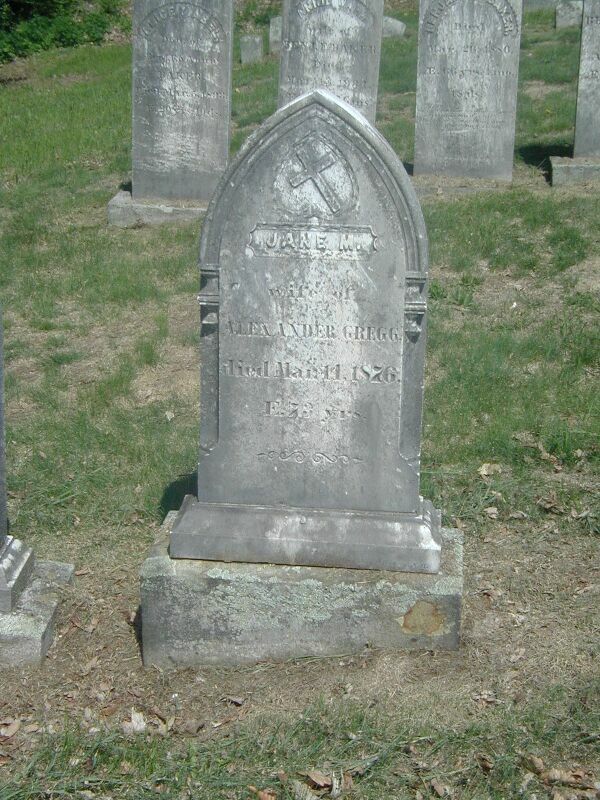 Ober, Jacob F., d. Feb. 7, 1824, ae. 75 yrs. Patterson, Dea. 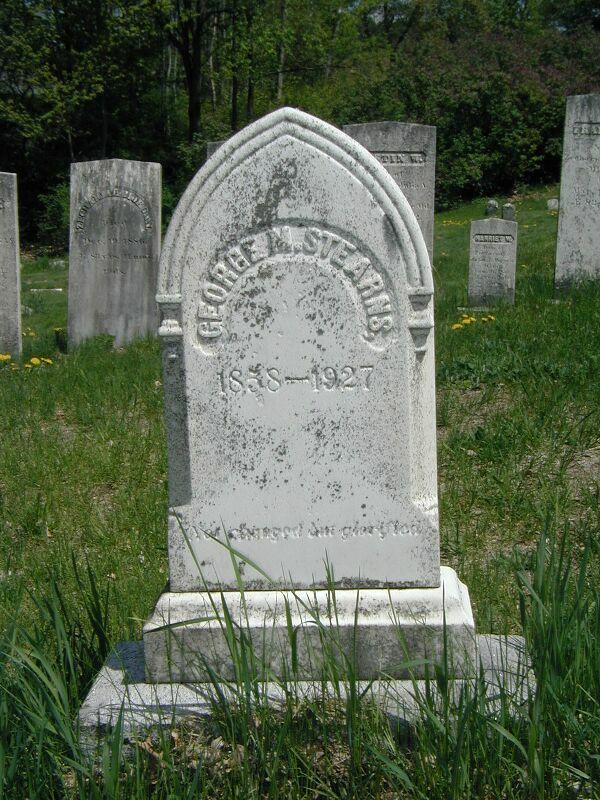 Robert, d. Sept. 15, 1828, ae. 84 yrs. 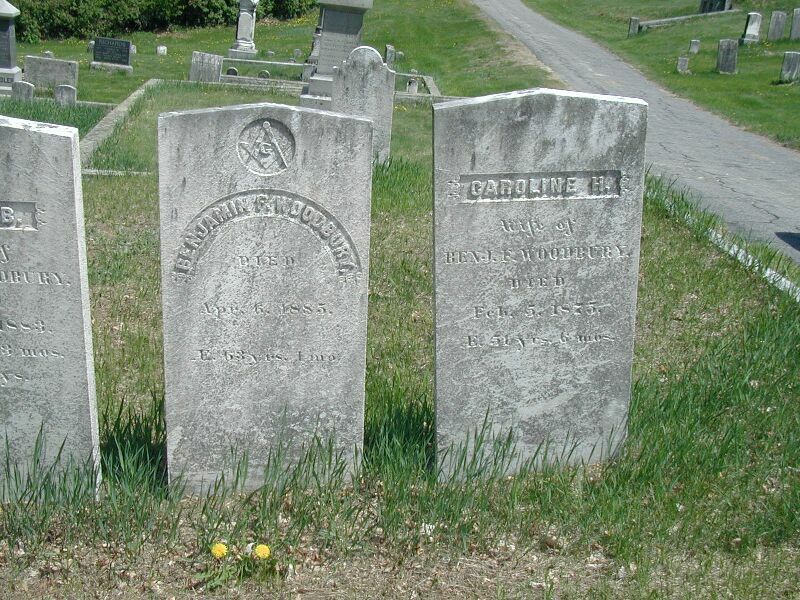 Patterson, Susannah, w. of Dea. Robert, d. Mar. 1, 1841, ae. 94 yrs. 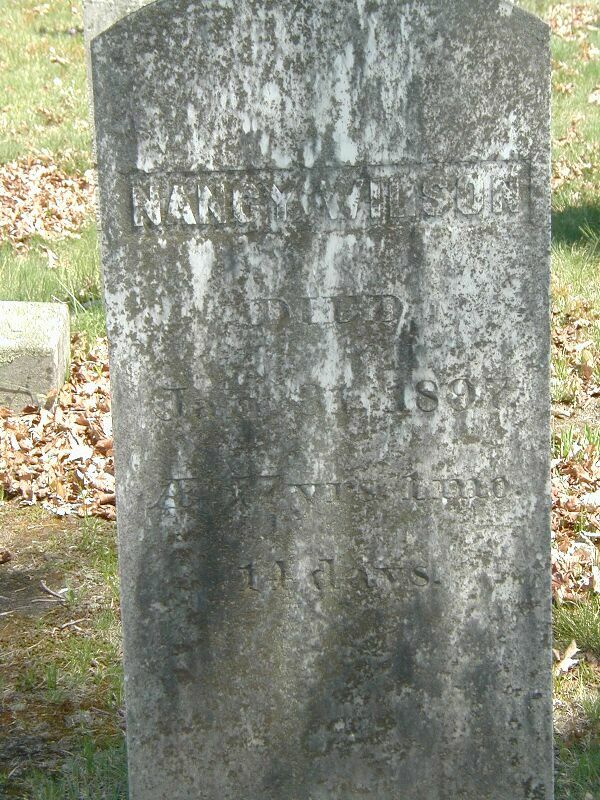 Russell, Mrs. Martha, w. of George, d. Feb. 2, 1813, ae. 72 yrs. Stinson, Mary, w. of Capt. 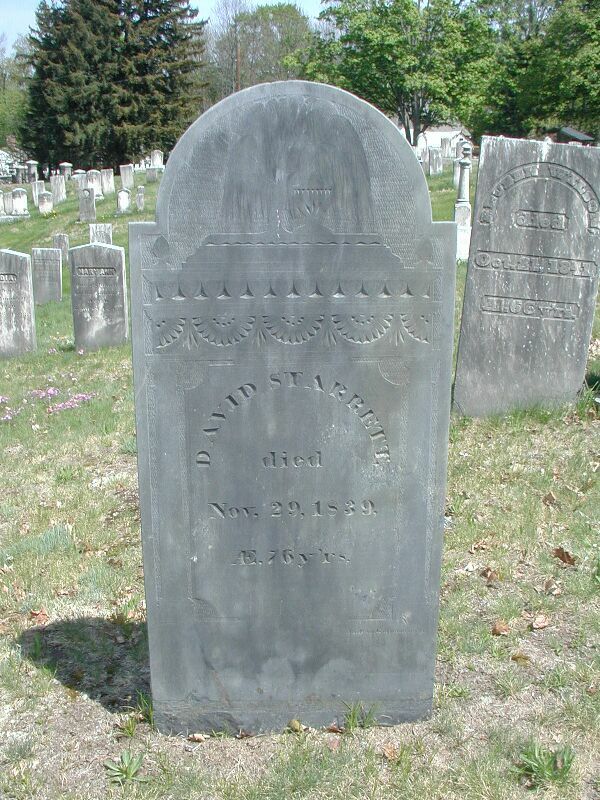 David, d. Jan. 29, 1798, ae. 86 yrs. Stinson, Capt. 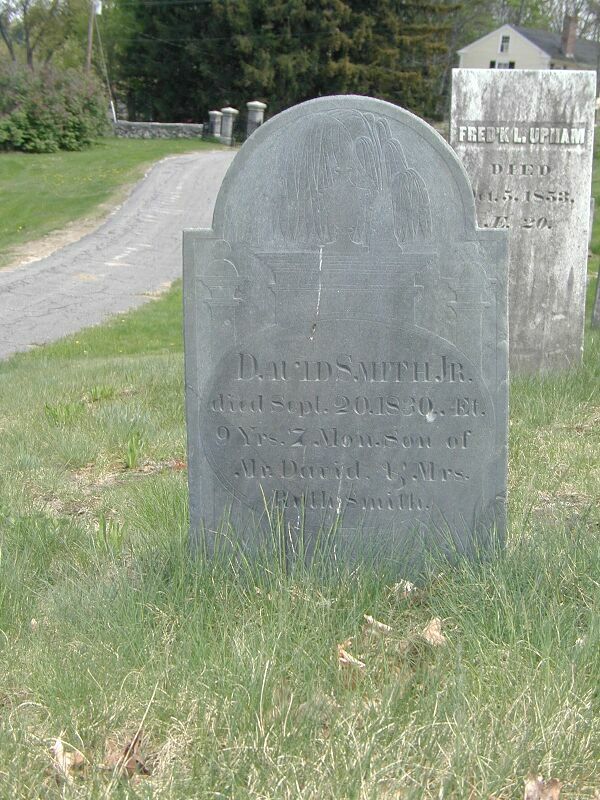 David, d. June 25, 1805, ae. 56 yrs. 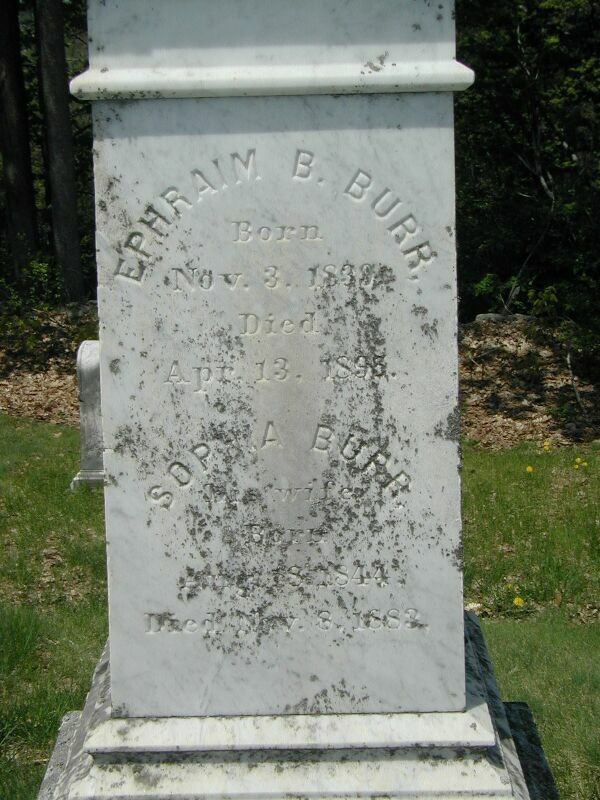 Warren, Josiah, d. June 29, 1826, ae. 86 yrs. 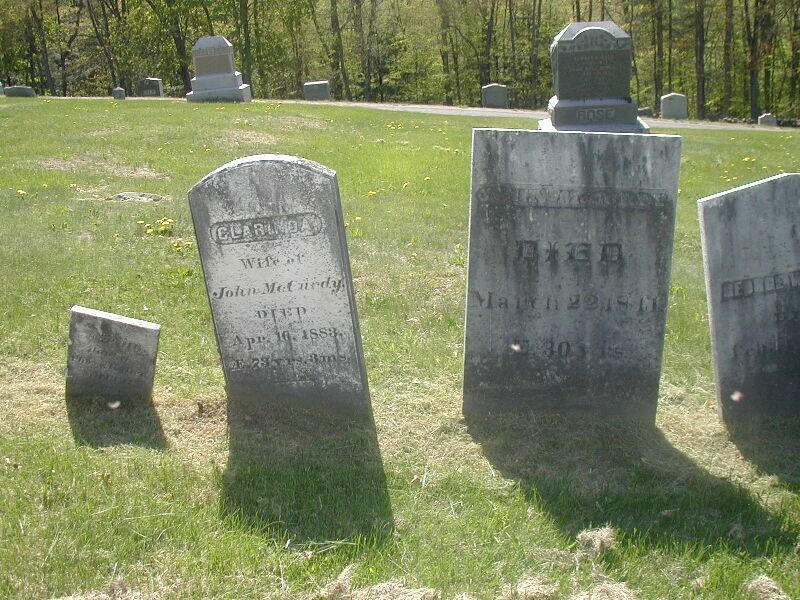 Warren, Jane, w. of Josiah, d. July 3, 1883, ae. 86 yrs. 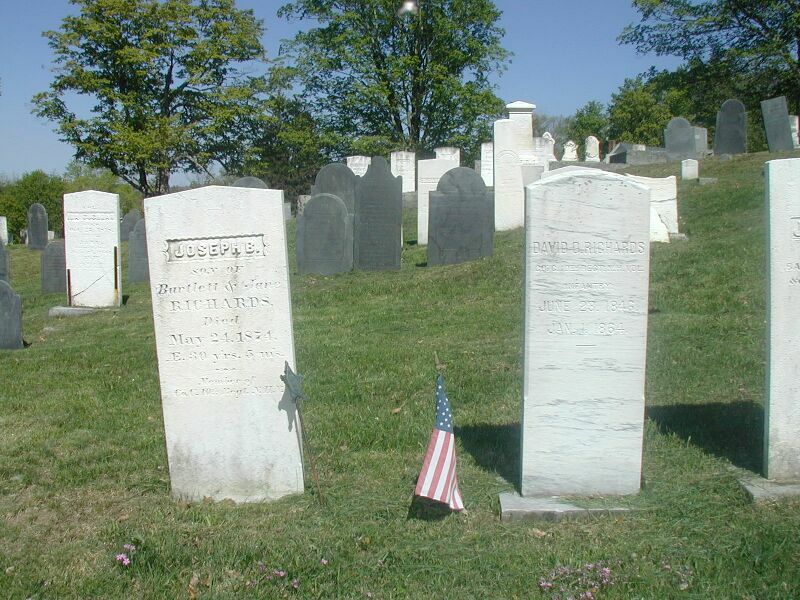 Wilson, Ensign Thomas, d. Sept. 25, 1794, ae. 71 yrs. Wilson, Mary, w. of Ensign Thomas, d. Apr. 24, 1795, ae. 66 yrs. Wilson, James, Esq. d. Jan. 11, 1818 ae. 58 yrs. 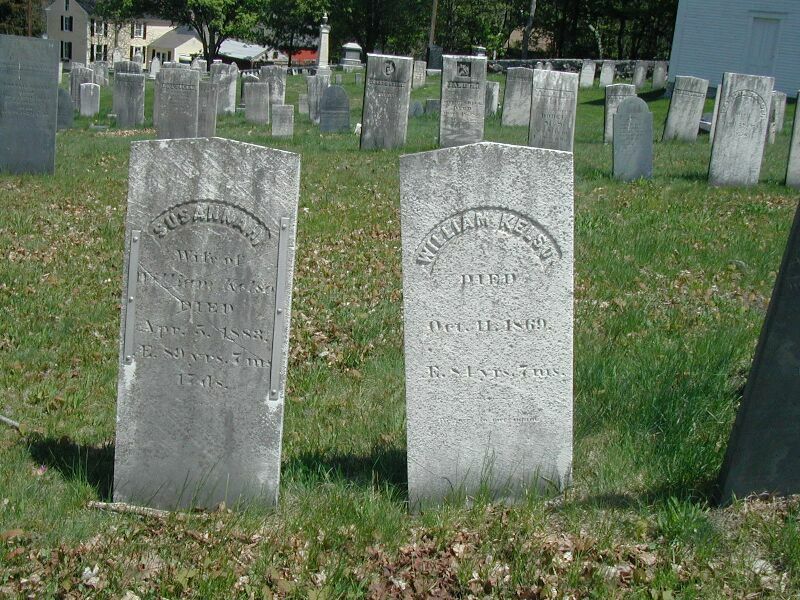 Wilson, Thomas, d. July 7, 1812, ae. 48 yrs.